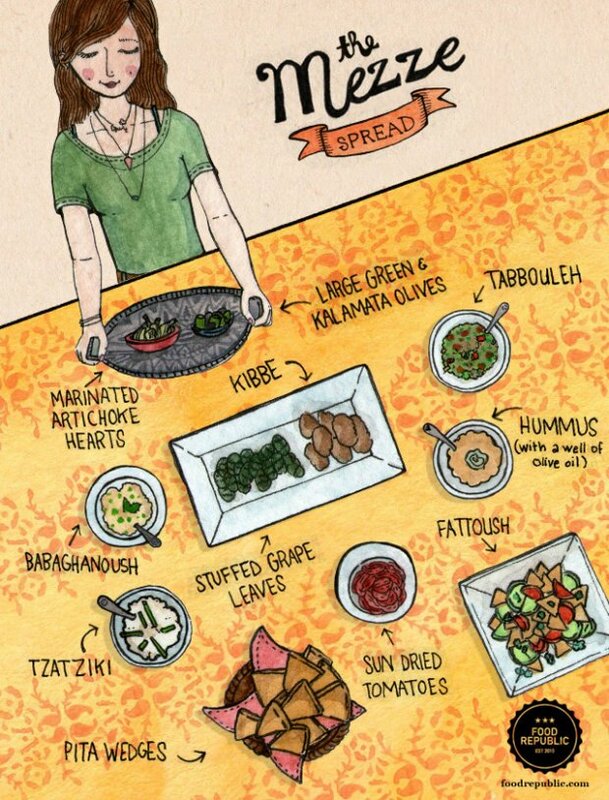 How to make a Middle Eastern Mezze Platter! What a fun month it has been! Exploring realms little known, I thoroughly enjoyed myself! Got to know quite a few histories and stories and the magic of how food connects. So now to the Mezze platter! Referred to as the Mediterranean Mezze, the Middle Eastern Mezza or the Lebanese Mezze platter- this is a veritable smorgasbord of delights. 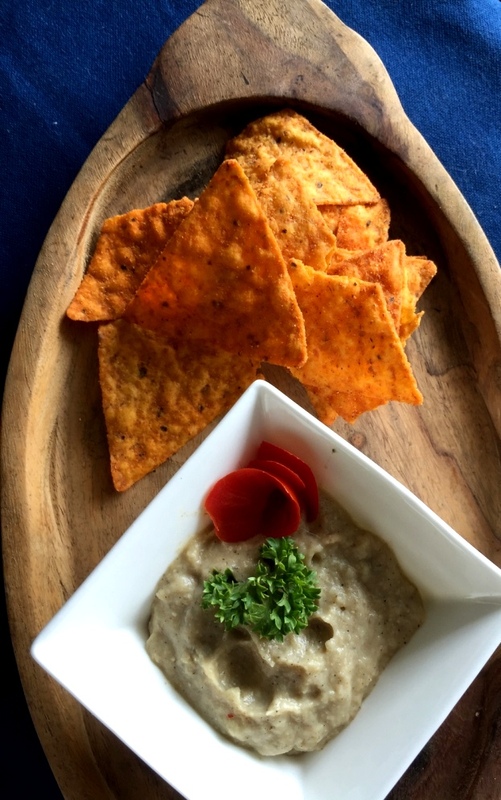 It is made up of an assortment of chips and dips, fritters and fries, salads and relishes. The Food Republic explains it so completely and with a cute illustration to boot! 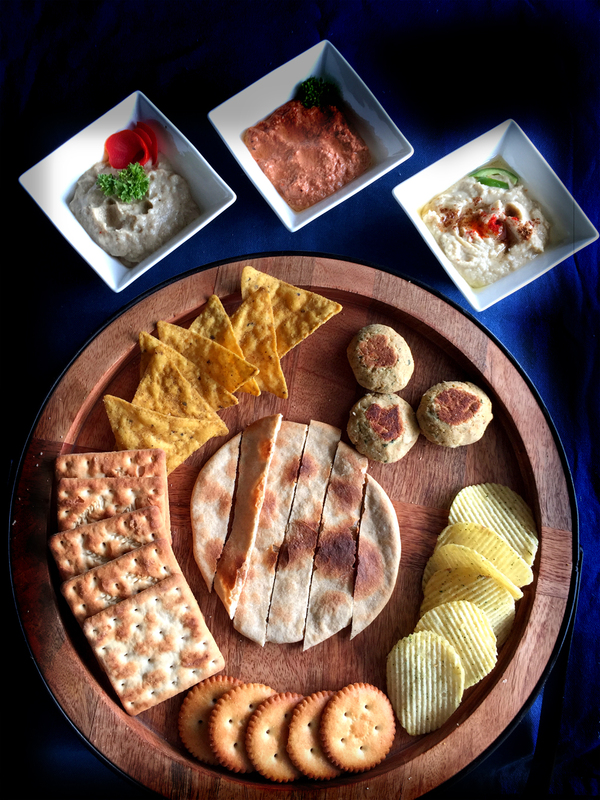 The mezze platter (sometimes spelled meze) is one of the more malleable snack trays, varying slightly depending on where it’s being served. It’s a popular way to start a meal in Turkey, Israel, Greece, Lebanon — spanning cultures across the Middle East and beyond. 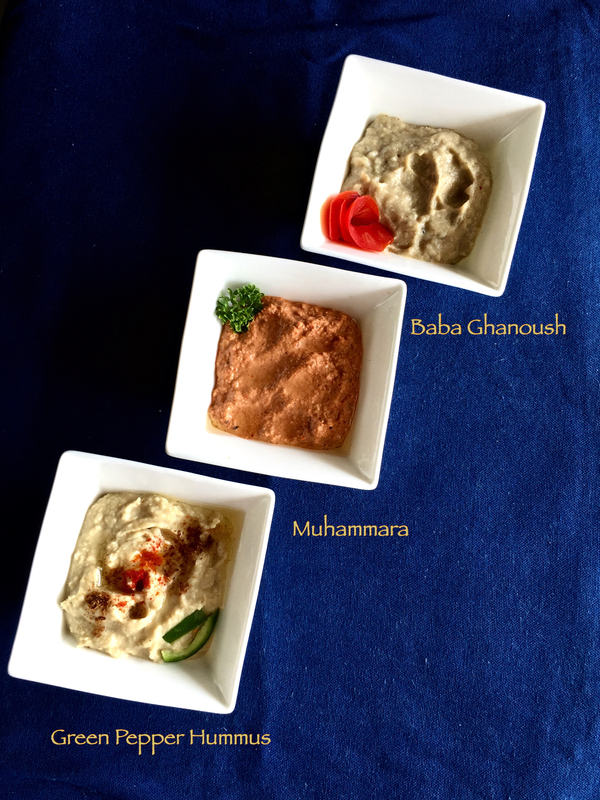 However you serve it or say it, the most important thing about mezze is what it means: it’s Arabic for sharing. Although this platter is meant to serve as a Starter to a meal, it is quite a meal in itself. I have a feeling after having feasted on these goodies, I would only head towards the desserts. I started with making Rob-e-Anar aka Pomegranate molaases. 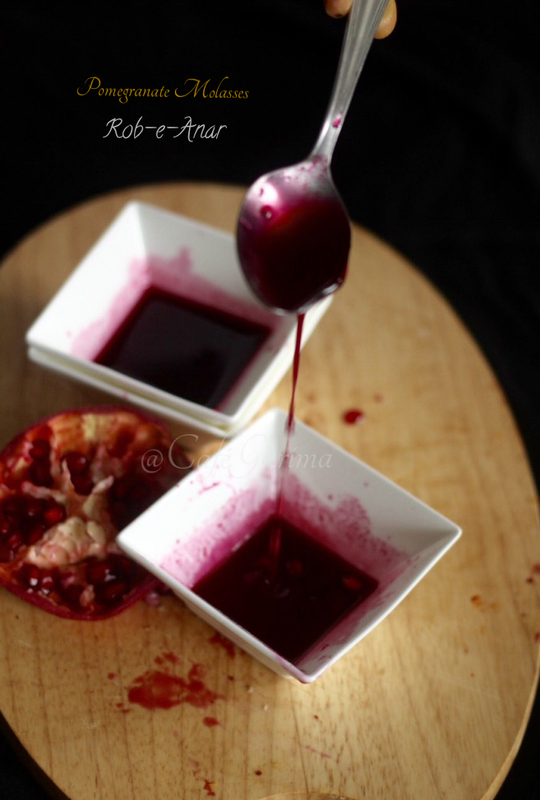 Pomegranate molasses, as they are an essential part of the Middle Eastern cuisine. 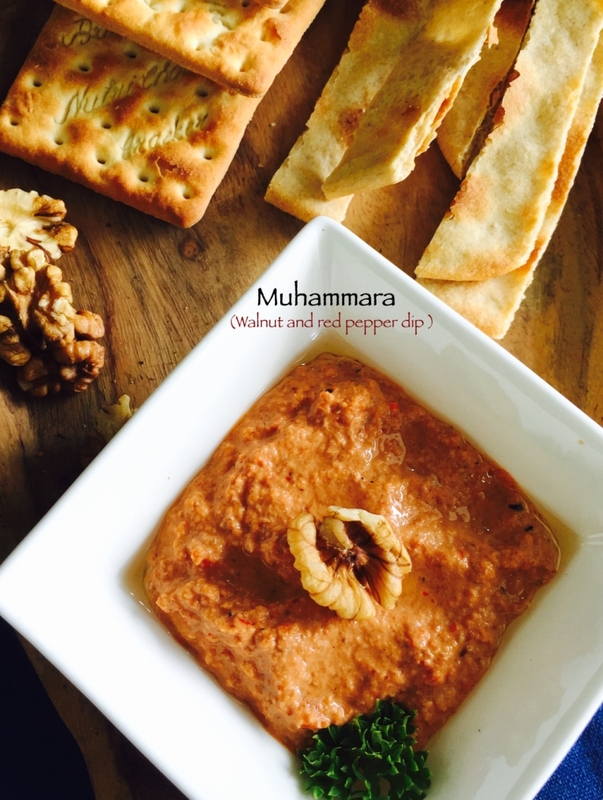 and the hot hot Harissa Yogurt dip! 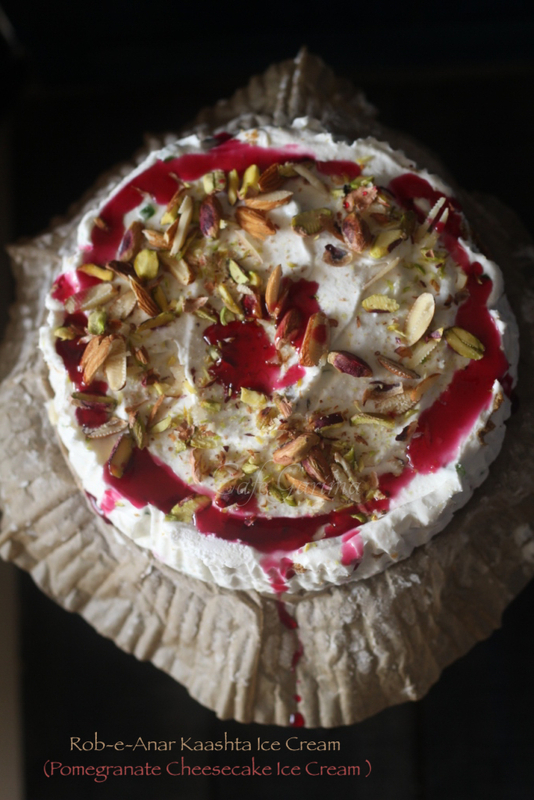 and the Basbousa cake dessert! Do we really grow up ever? Mmm… I say no! I recently got a brand new oven, a much larger one than my previous tiny one, and was all excited to try something new! 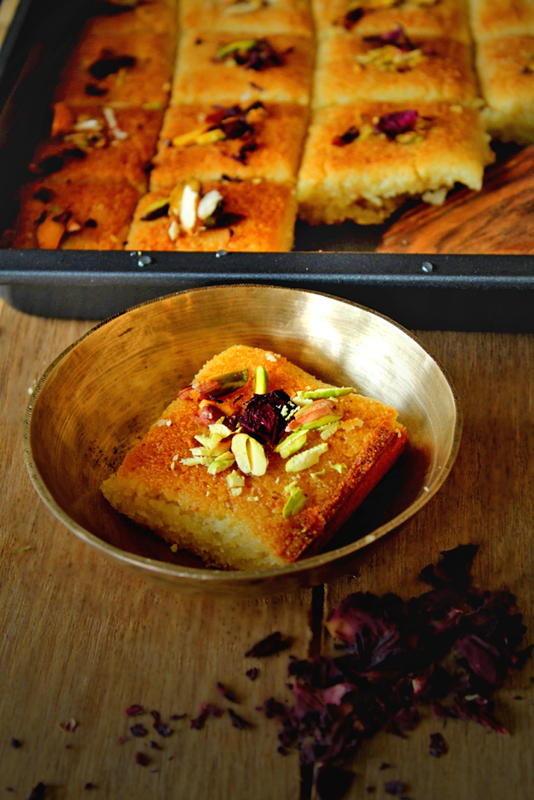 Basbousa- This beautiful moist Arabian cake has been on my mind since Christmas last year when I saw it on Shireen’s blog here. 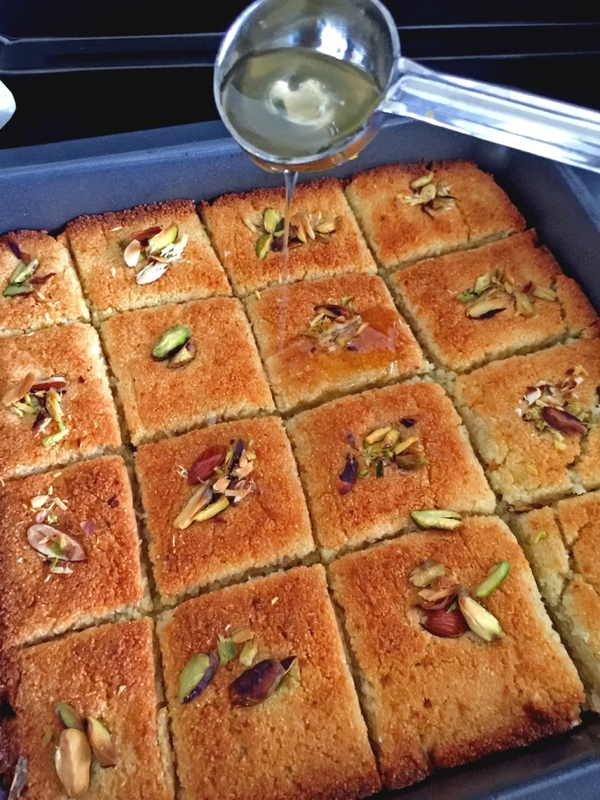 Hopped to Shireen’s blog but realised I had no tahina, condensed milk or desiccated coconut. 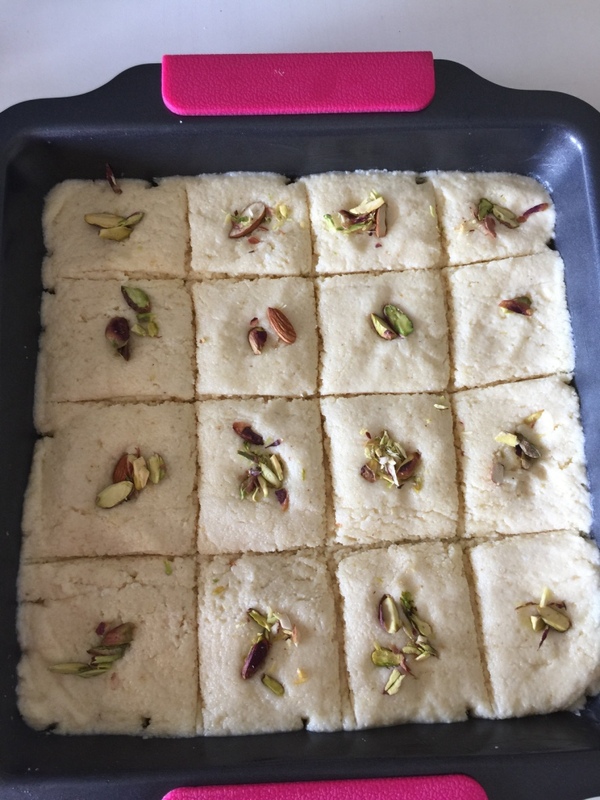 Hunted some more and came upon this recipe at MAD About Kitchen, a blog I love to visit for its recipes as well as to admire the beautiful clicks. 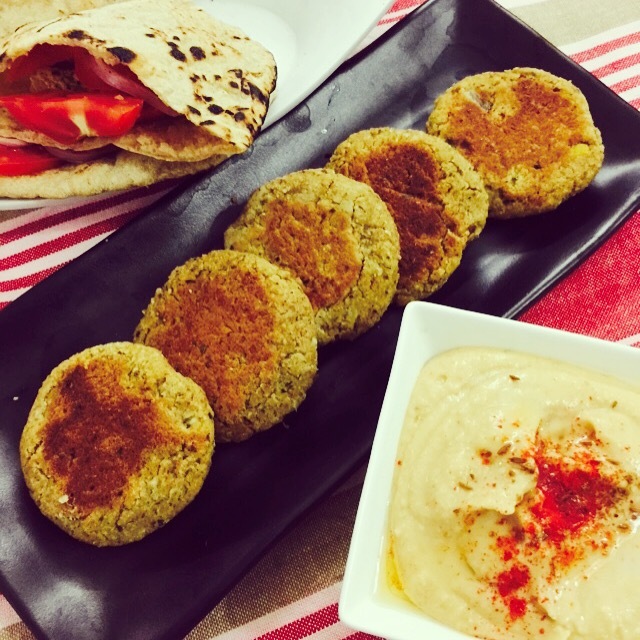 Thanks for the recipe Madhuri! It felt like an apt treat to wind up my Lebanese/Mediterranean/Middle Eastern journey this month. I made minor changes like using ghee instead of butter and orange syrup in place of orange blossom water. 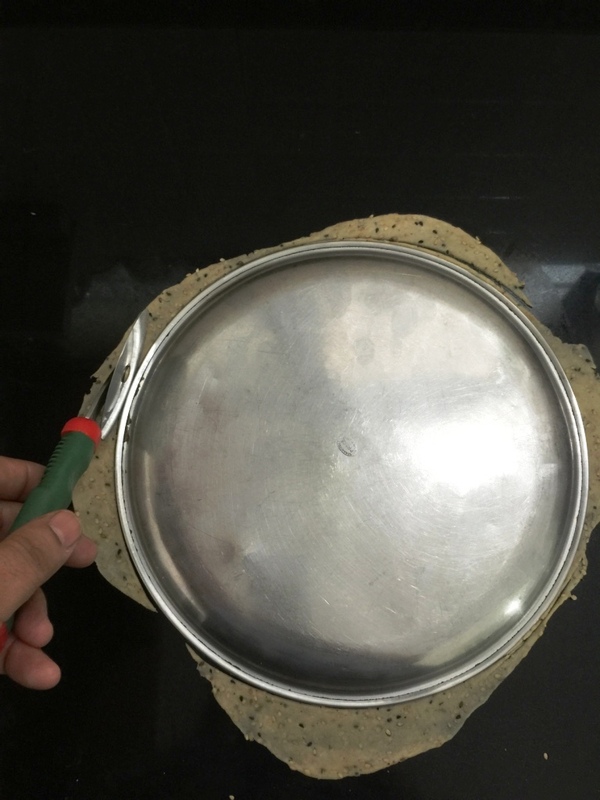 Grease a 24×24 inch pan. In a large bowl mix semolina, baking powder and powdered sugar. Mix well till combined. 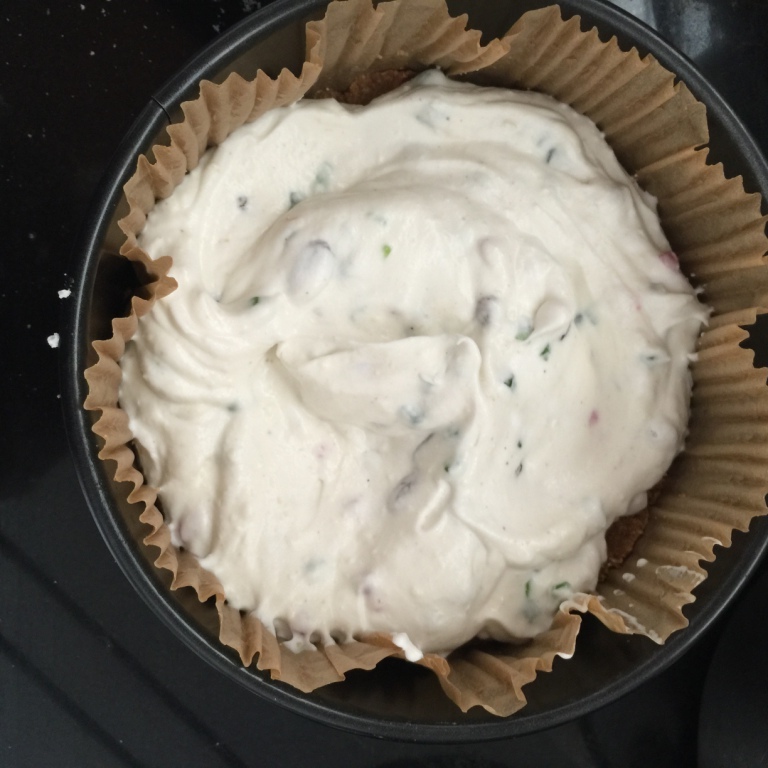 It will be thicker than any other cake batter and is meant to be like that. Transfer to the greased pan and pat down with fingers to level. Make impressions to cut out squares later. 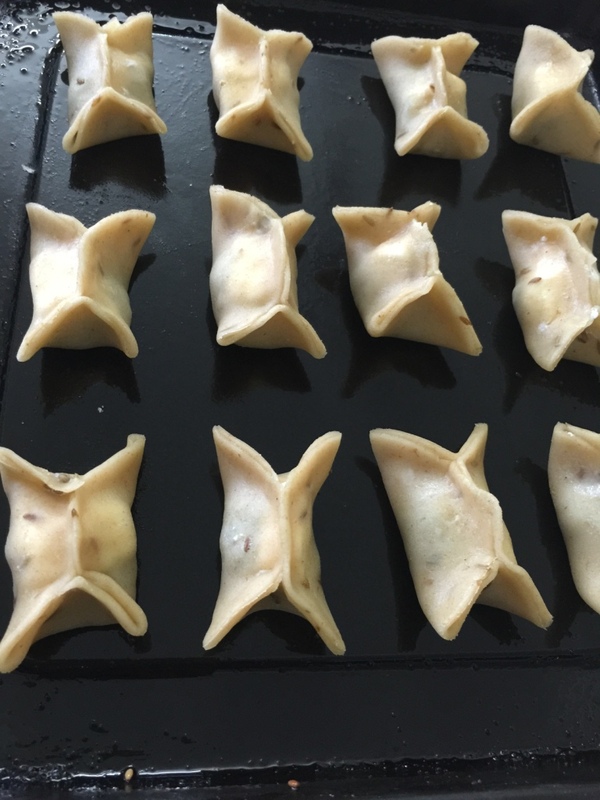 Place some chopped almonds and pistachios at the centre of each square. 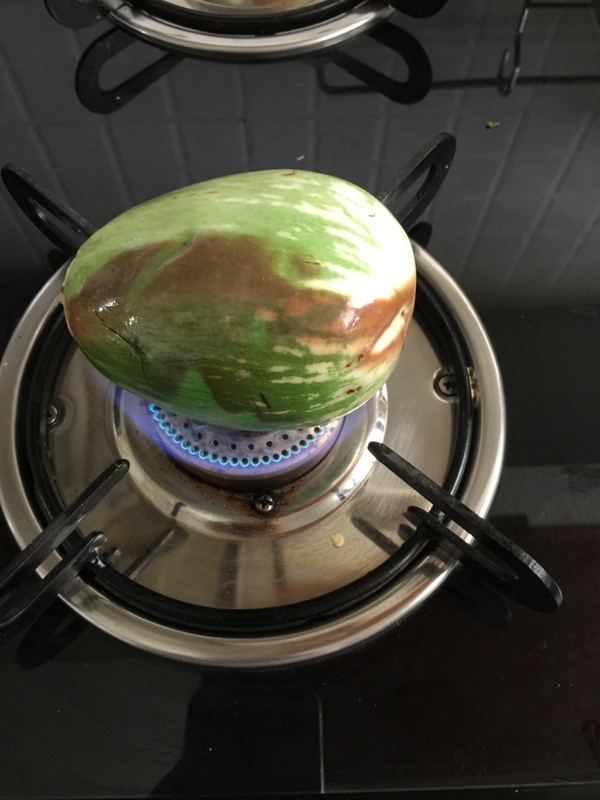 Cover and rest for one hour. Yeah! One hour. This helps the cake rise well. Bake in a preheated oven at 180C till the top browns nicely. 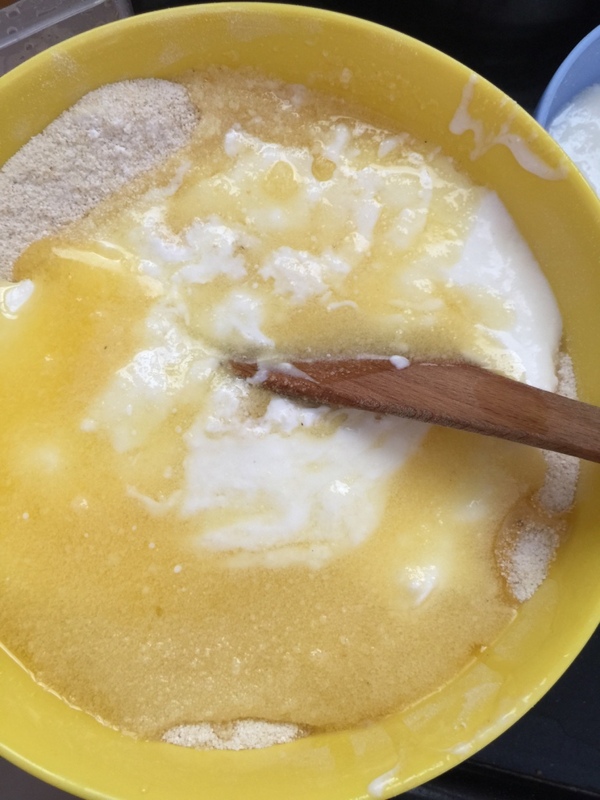 While the cake is resting for an hour, prepare the sugar syrup. Bring water and sugar to a boil. Let simmer for 6-7 minutes. Add the lemon juice. Remove from heat and add rose water and orange syrup. Let cool. As soon as the cake is out of the oven, sprinkle the top with the sugar syrup. Do it in batches and slowly so that the cake soaks up the syrup. So not put all the syrup at once. Cut along the marked lined into squares. Sprinkle some dry rose petals. Garnish with some fresh and dry petals. Serve straight from the pan lifting gently with a flat small spatula. This is best enjoyed warm. We teamed it up with thick mango shake and with vanilla ice cream another time. Both combinations were yum! 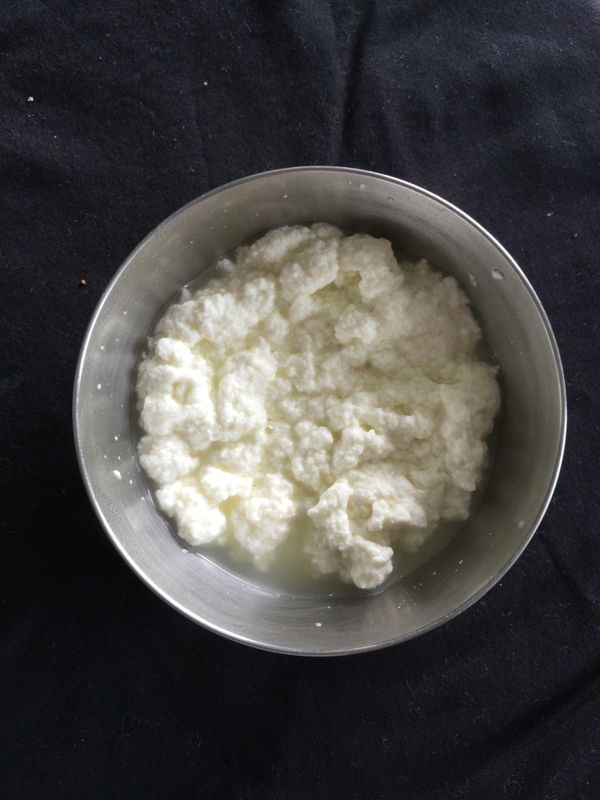 I recently got introduced to feta and its salty rich flavour. 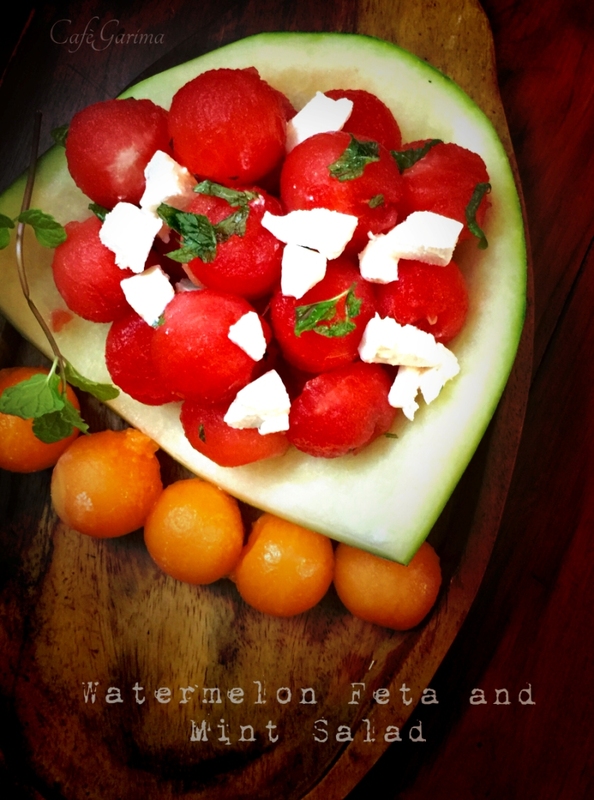 The sweetness of the watermelon balances the salt beautifully and the mint adds a fresh ,well minty, tang. It’s a glorious burst of flavours and the palate rejoices! There is not much of a recipe apart from getting the three elements together. 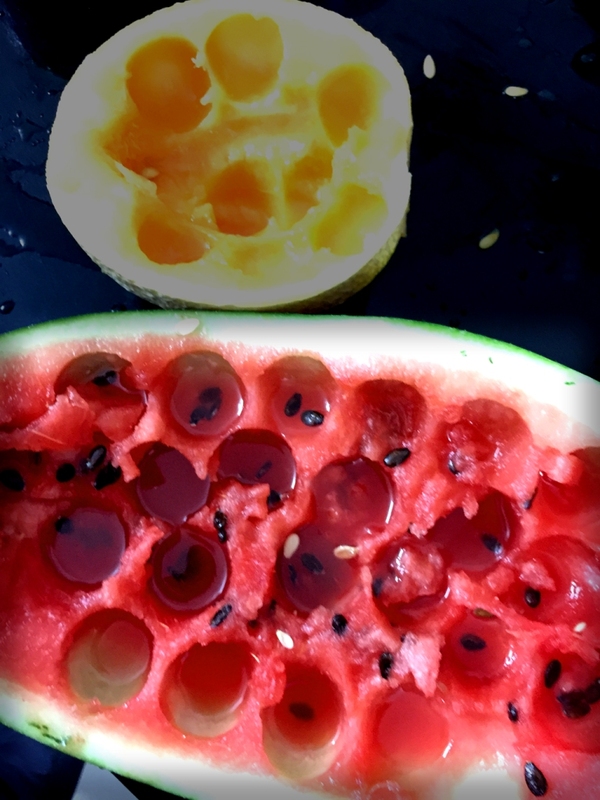 I look a medium sized sweet watermelon and scooped some balls out from the seedless areas of the melon. 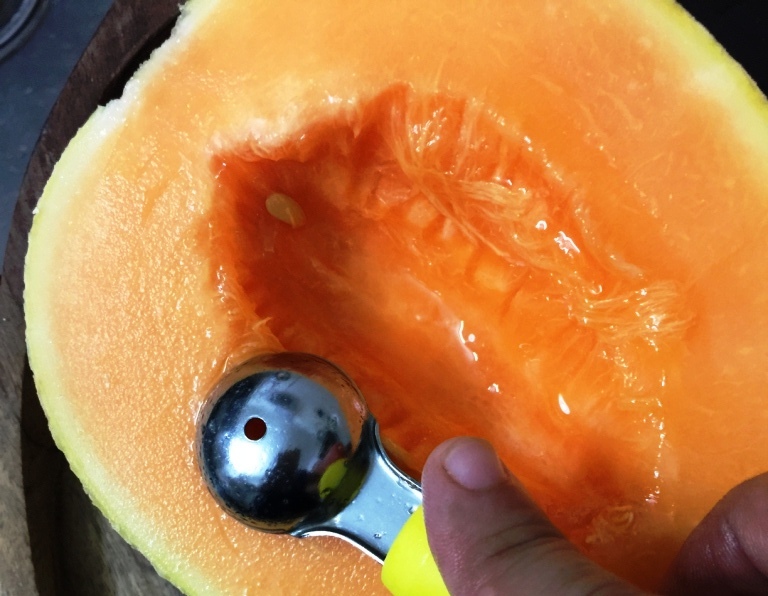 To get nice and round balls, press the melon baller deep into the melon flesh. 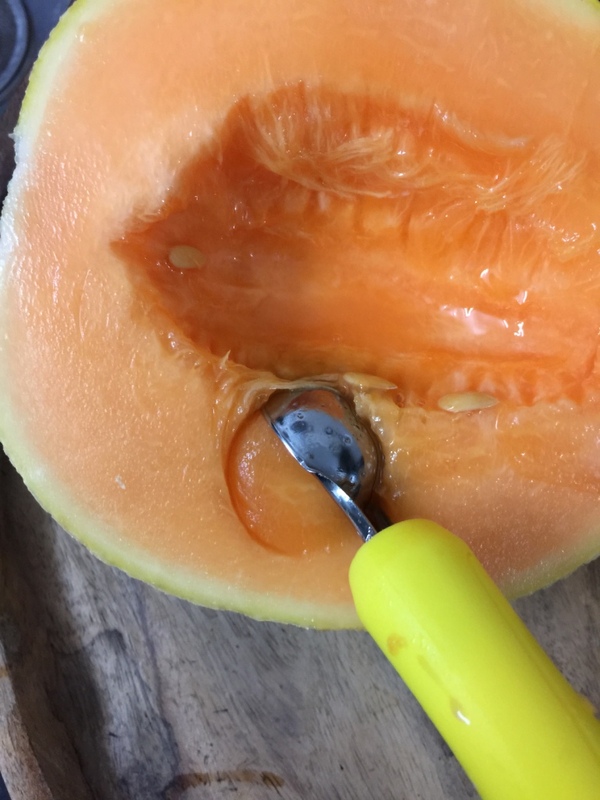 If you can get the seedless variety, nothing like it.Else scoop out from the seedless part. 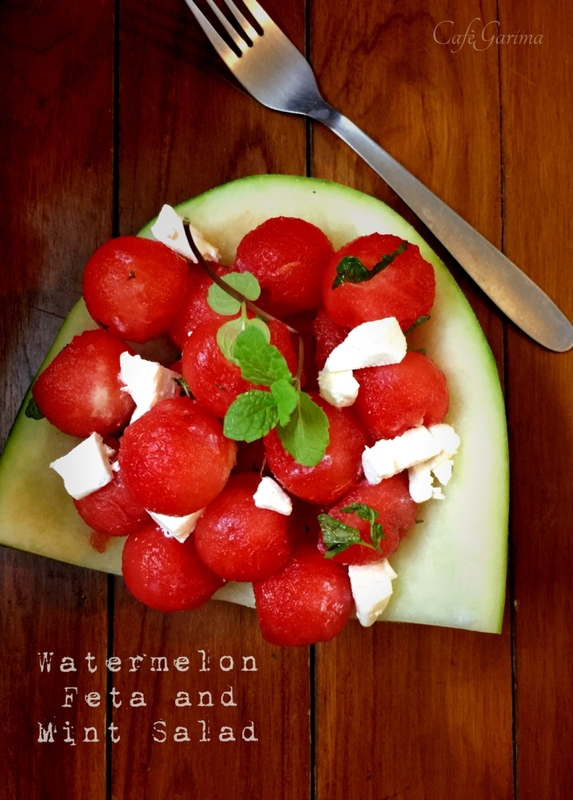 Tear 10-12 fresh mint leaves and mix gently with the watermelon balls. 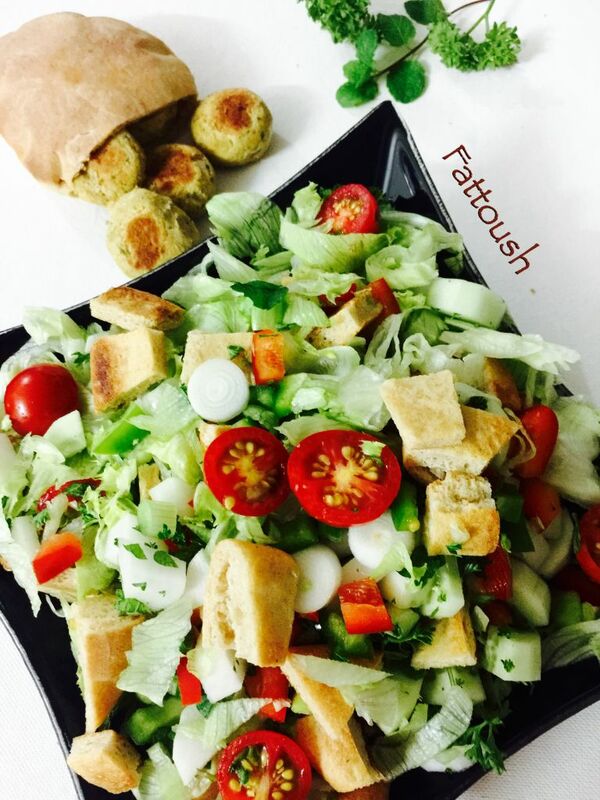 Cube about 50 grams of feta and top the salad with it. Serve immediately! 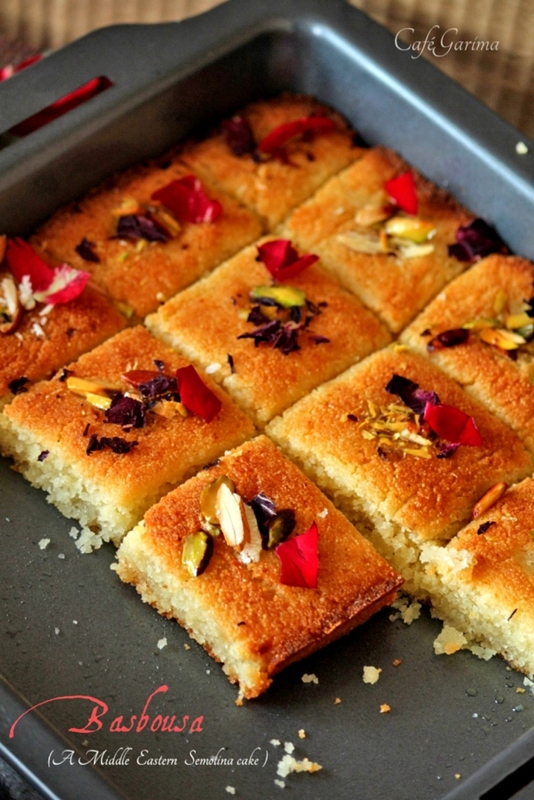 Recipe sourced from The Persian Kitchen. 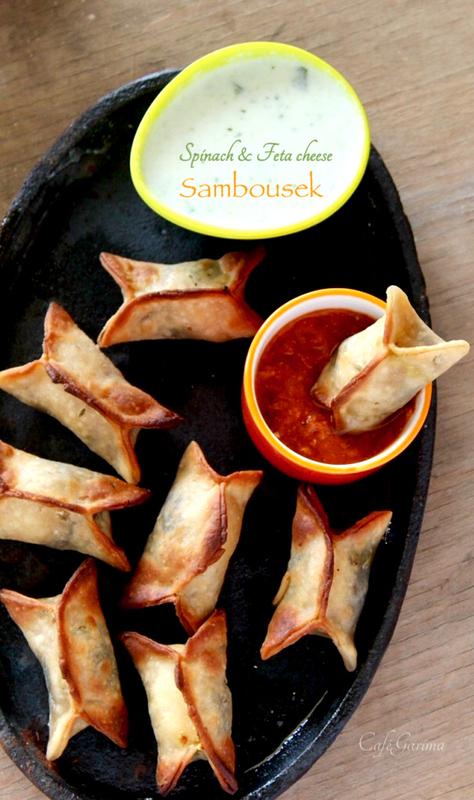 Sambousek- the Middle Eastern brother of Samosa! Sambousek! As soon as I read the word aloud and looked a picture of this savoury from the Mediterranean Mezze Platter, I said to myself; Aha!! 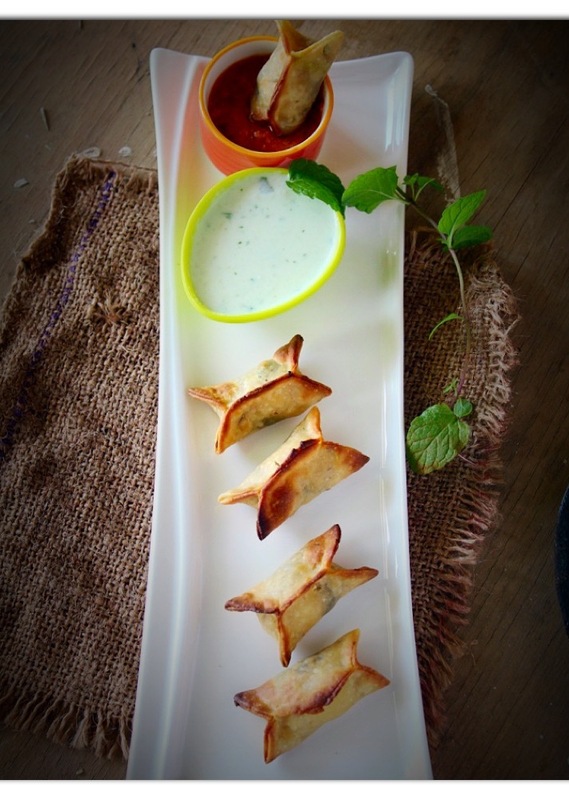 A brethren of the very popular street snack Samosa- is it! I was delighted when my first reaction was proven right! 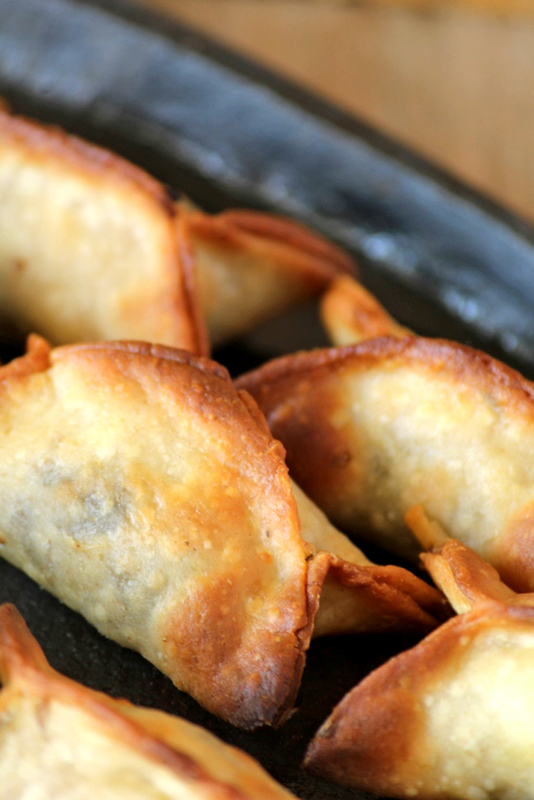 These can be fried or baked. I baked them and did not miss the fried version at all! 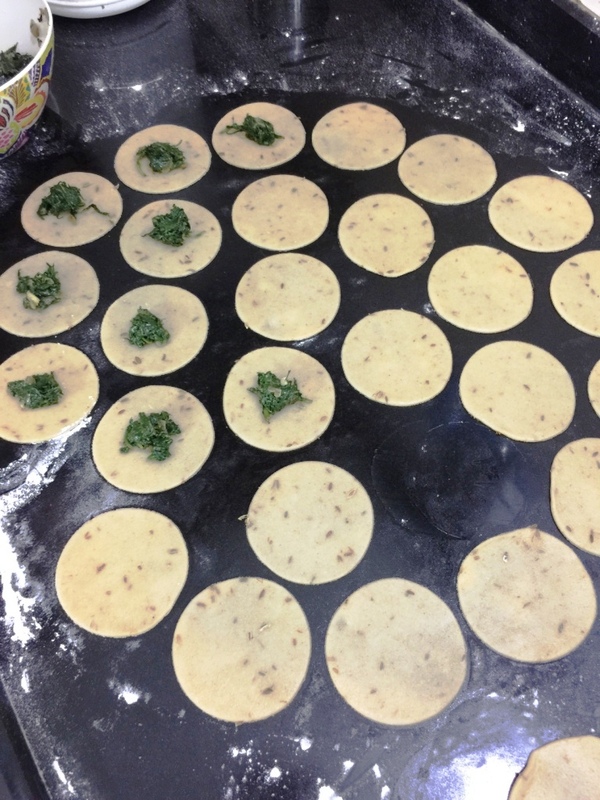 And to add to the joy- these are wholegrain, made from coarse Punjabi aata. If this isn’t snacking heaven- what is! 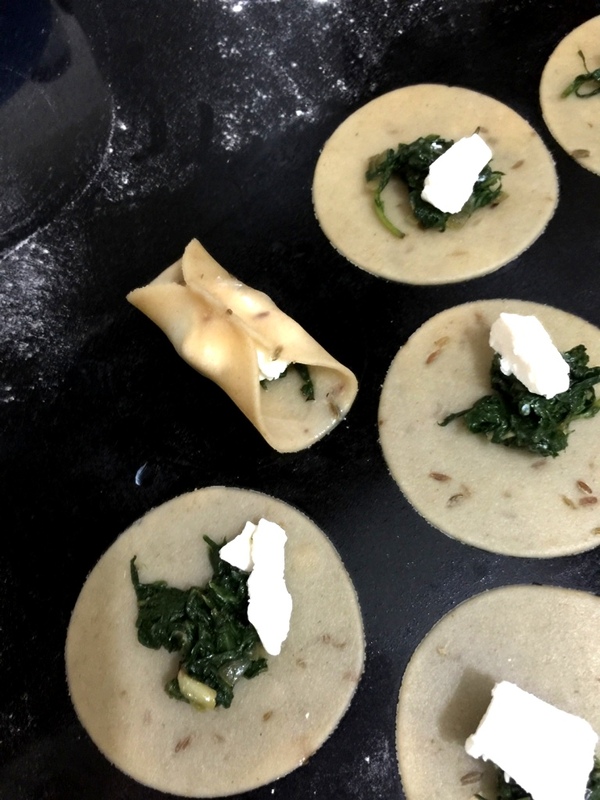 I filled the Sambouseks with a feta cheese and spinach filling. 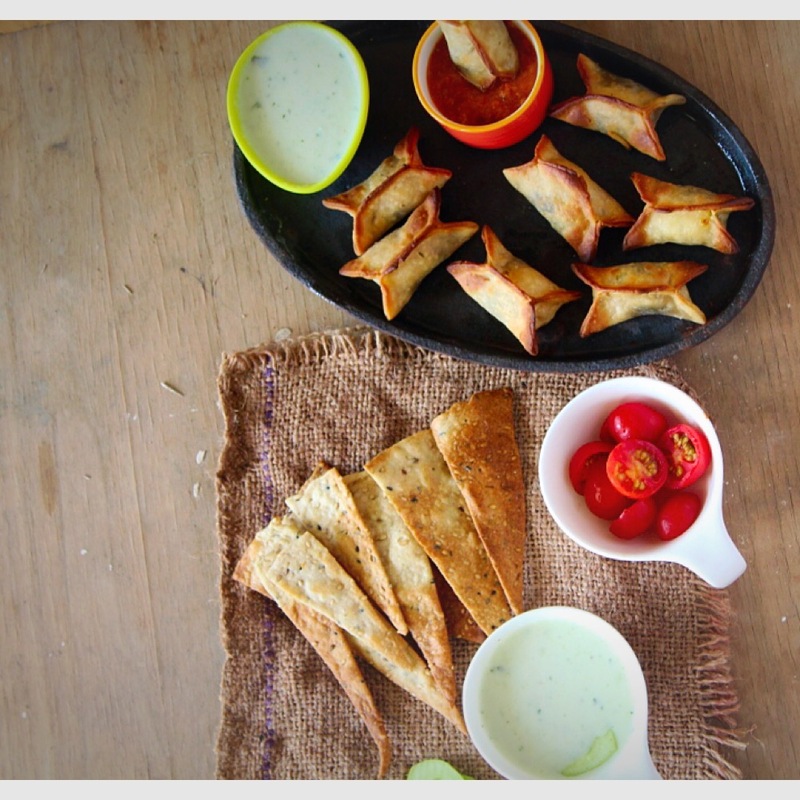 Play around and use anything you like for the filling, sweet or savoury. I adapted the recipe from Natalie Ward’s wonderful vegetarian blog, where she has made them with fig and feta. Add salt and olive oil to the flour in a large bowl. 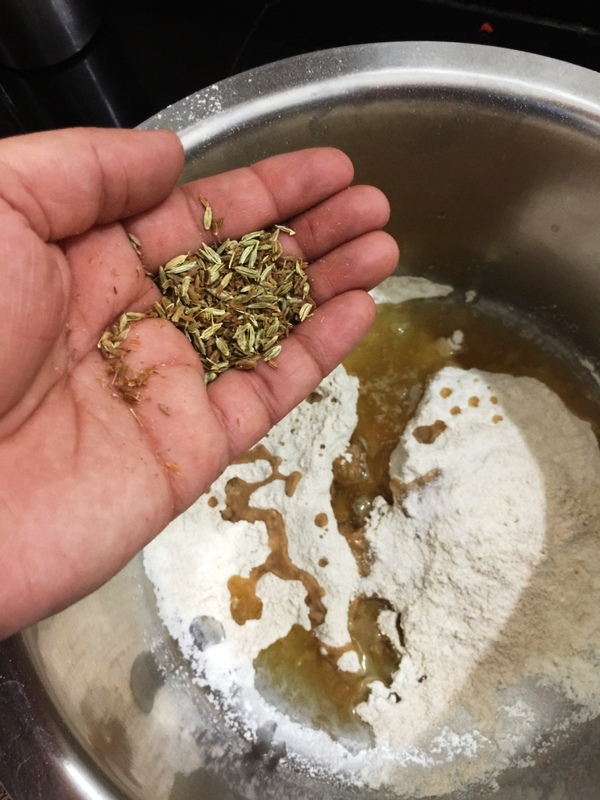 Crush the fennel and cumin slightly with a rolling pin (to release the aroma and flavours better) and add to the flour. Mix well and knead well to get a soft and supple dough. Transfer to an airtight box or cling film and leave in the fridge for an hour. Heat the oil and add the onion and garlic. 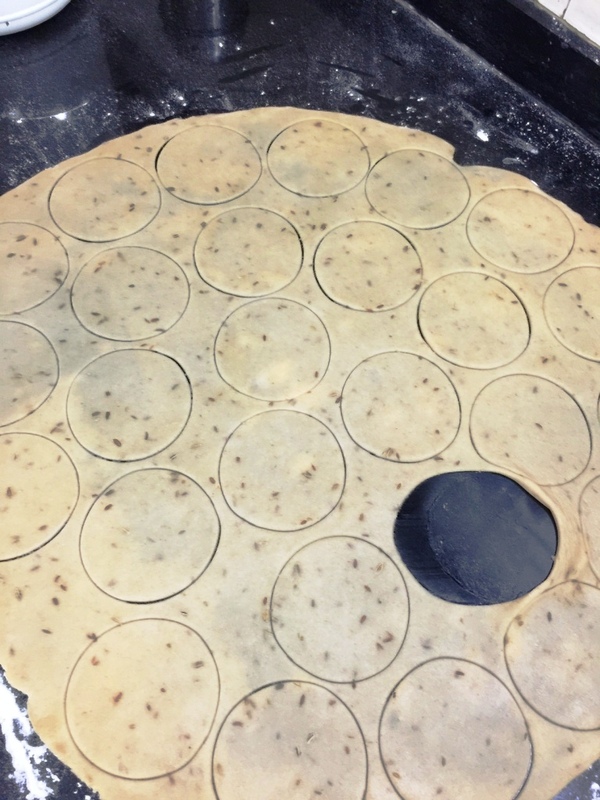 On a well floured surface roll out about 3mm thick and cut out circles. 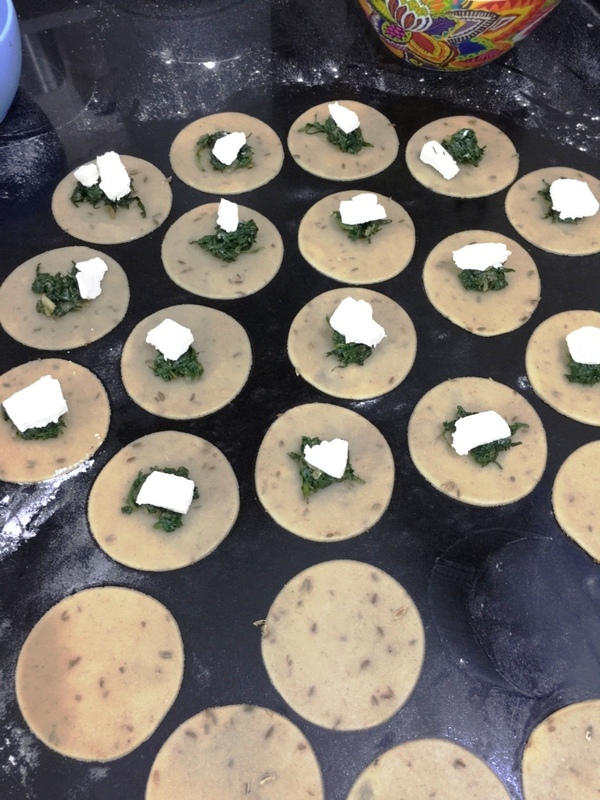 Place a spoonful of spinach filling in the centre and top with a piece of feta. 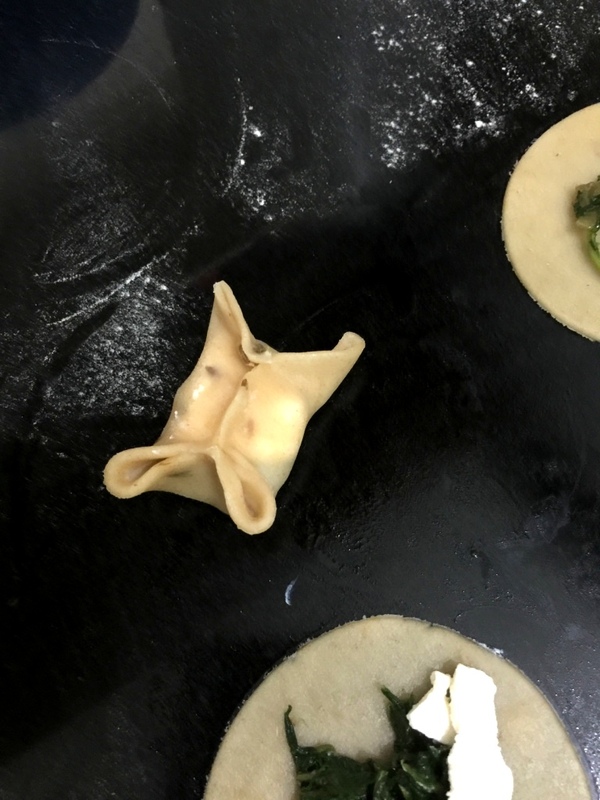 Moisten the edges of the dough circle and bring two opposite ends up and seal. 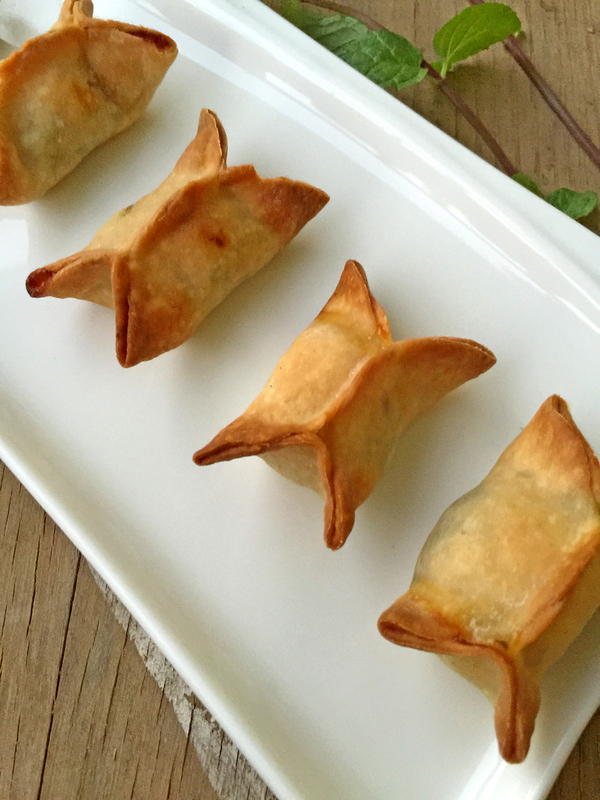 Transfer them to a greased baking dish and brush the sambousek with olive oil. Bake in a pre heated oven at 180C till they brown. Brush very lightly with oilve oil or butter and serve hot. 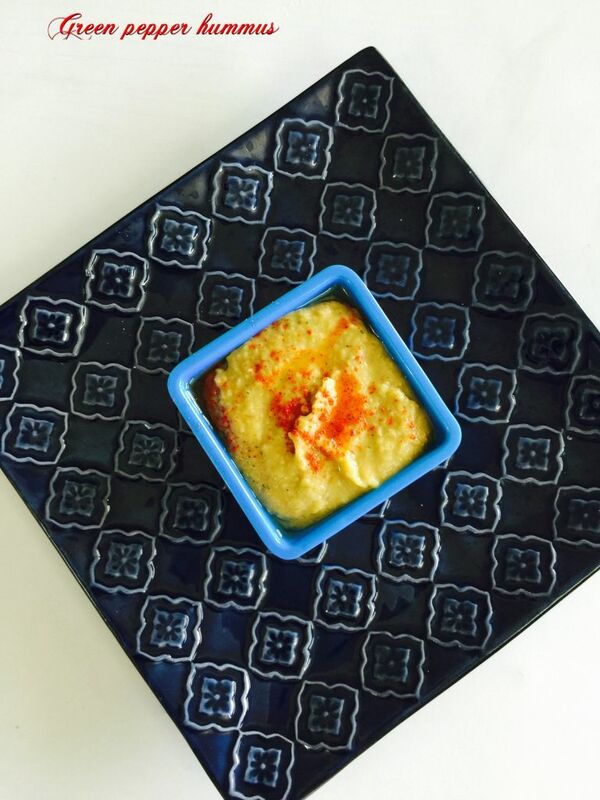 Serve with Tzaziki and Harissa yogurt dip. 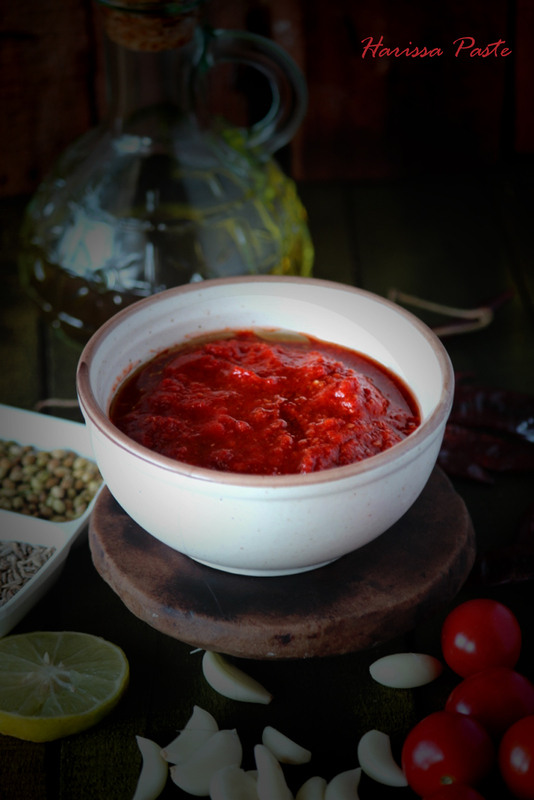 Harissa is another sauce I knew nothing about till recently just like the Tzatziki. And just like the Tzatziki, reading up made me think of a chutney which is a staple in Rajasthani households – ‘Lehsun/Garlic ki chutney’! The same method i.e. 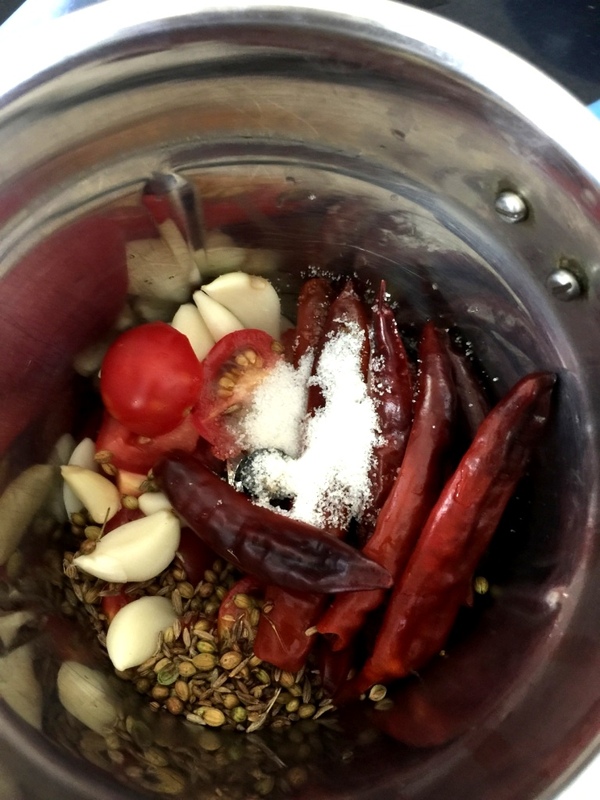 soaking of chillies and grinding with garlic and spices- quite a few of them that I use in my kitchen on a daily basis like the coriander and the cumin. 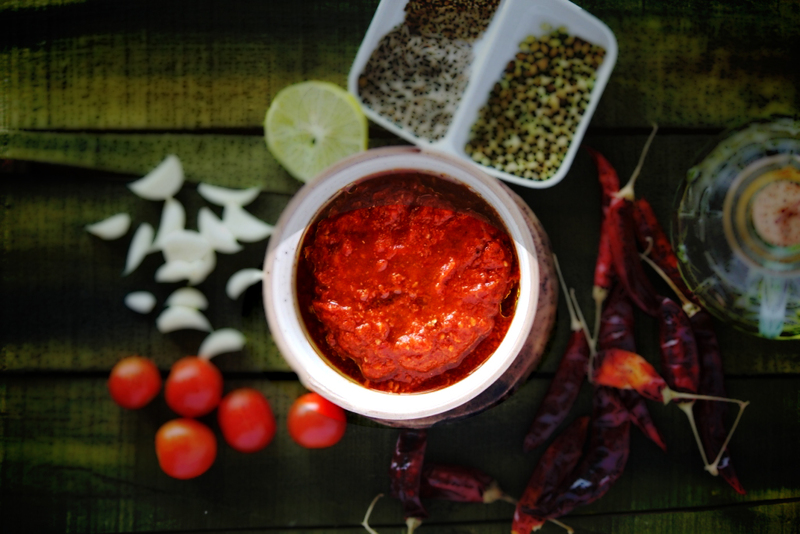 The pungent taste and the versatility.The only difference being that lehsun ki chutney is cooked in oil and Harissa is stored under a layer of oil. Any kind of chillies may be used. 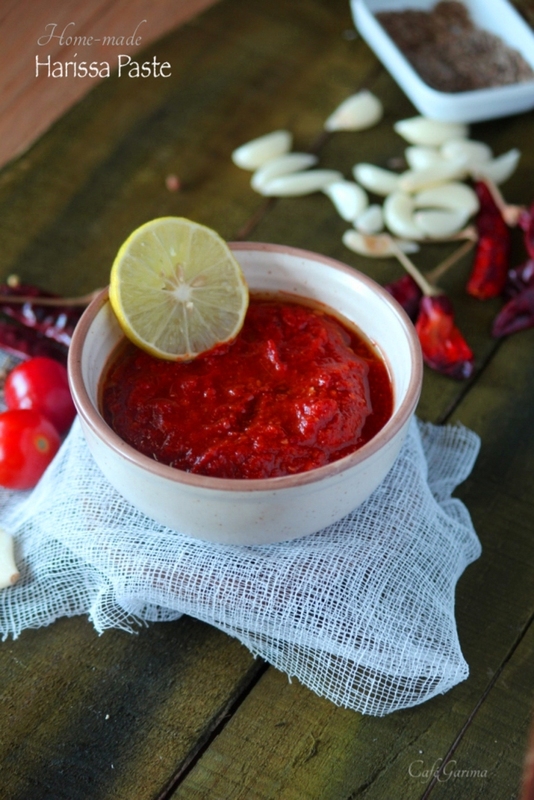 For a less pungent paste, add some charred red peppers along with chillies. I made it with Byadgi chilli and it came out nice and just the right level of pungent. A combination of red peppers and chilli peppers may also be used. 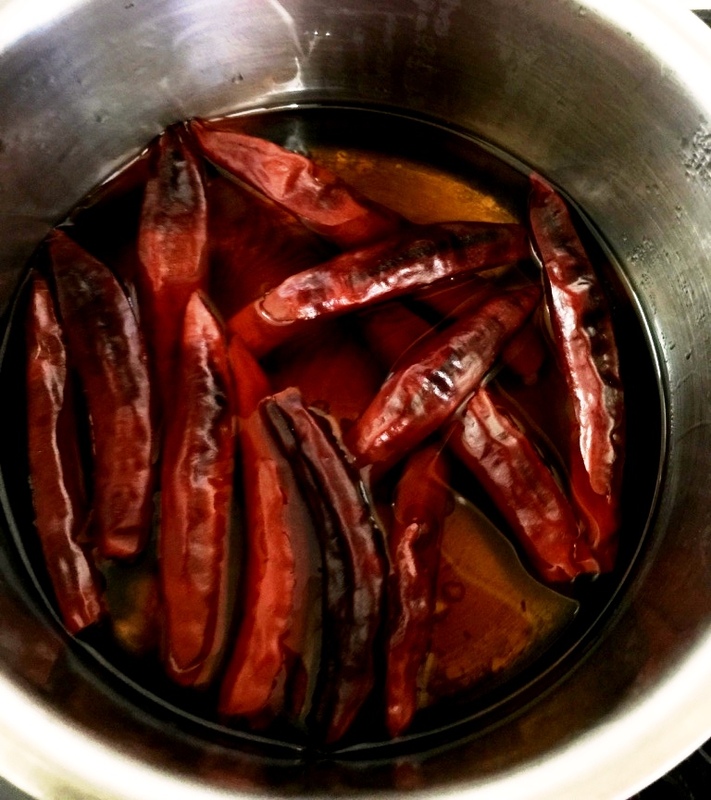 Remove the stems of the chillies and soak for 30 mins in hot water. Store the water and use in case needed while blending the paste. 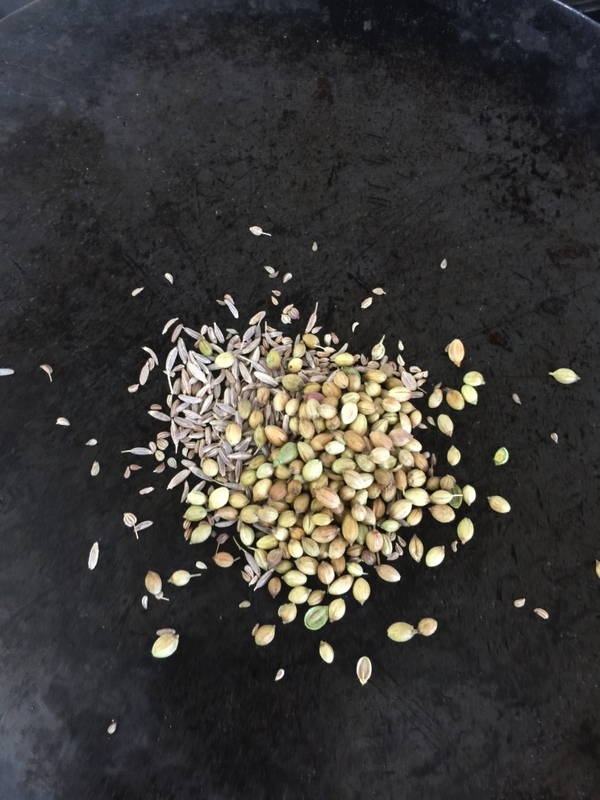 Dry roast the caraway, coriander and cumin. Let cool. 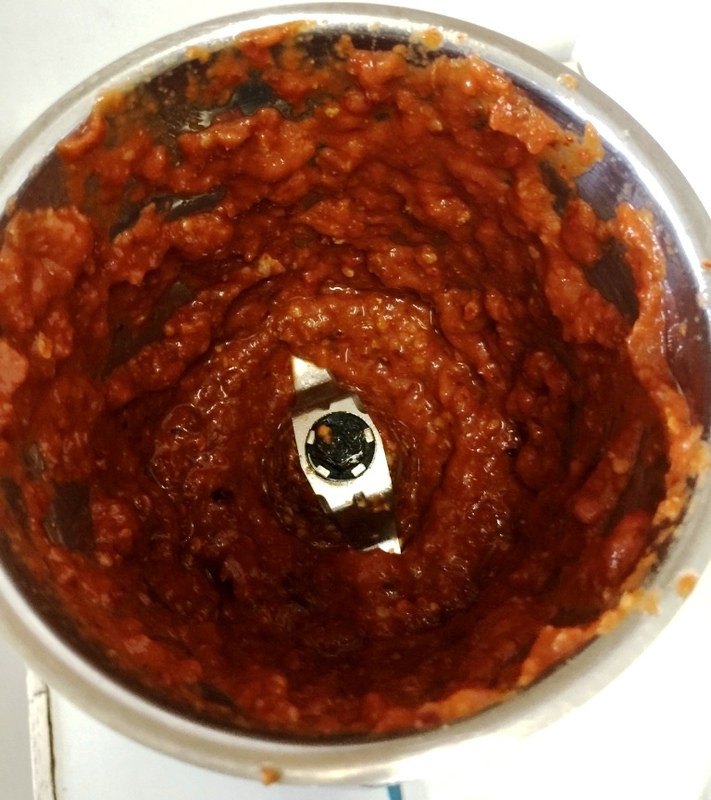 In a food processor add the chillies, garlic, tomato, salt, the roasted spices, lemon juice and grind to a thick, coarse paste adding EVOO slowly. Store covered with a thin layer of olive oil. The paste stays good for a month in the refrigerator. Keep adding some olive oil as you scoop the paste off the top. 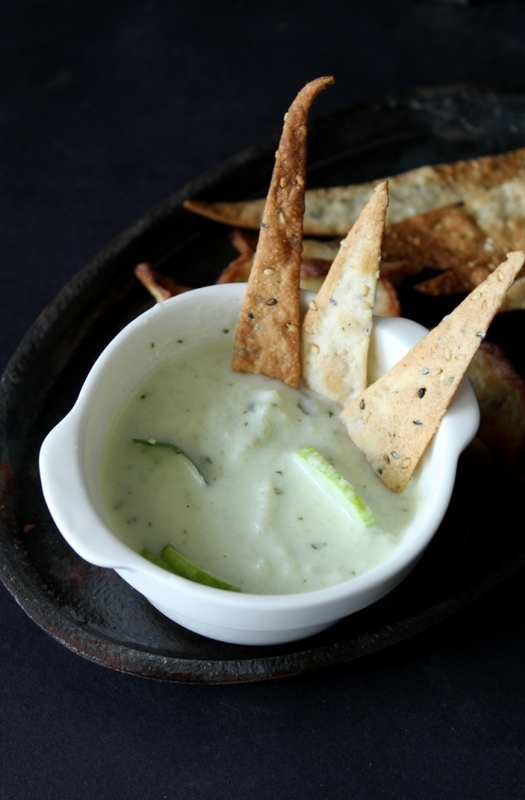 To make a dipping sauce, stir a couple of spoons of the paste into a cup of thick yogurt. 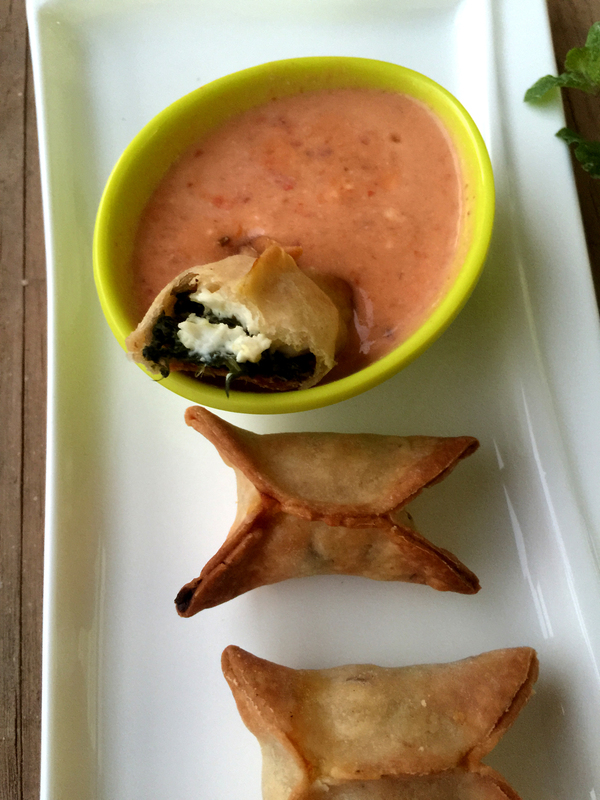 Serve with chips,crackers or like I did, with Sambousek! Recipe sourced and adapted from The Kitchn. I confess, the name Tzatziki (Pronounced tsa-tsi-ki) kind of stumped me (To add to the fun it is called ‘cha-chi-ki’ in Greek! ). I am not sure I would have ventured giving it a go had I not been on a Middle Eastern mission this month. But when I looked at the recipe, it was simplicity itself! 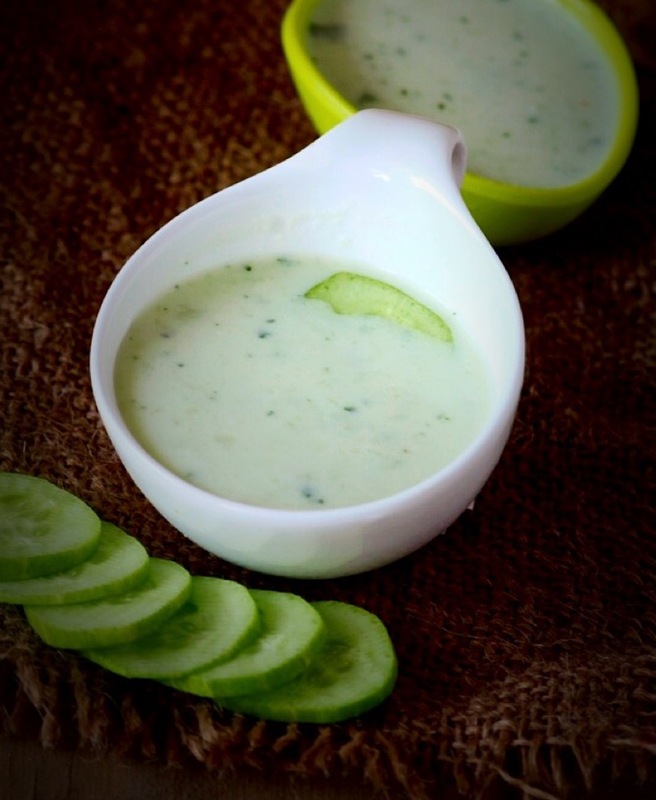 Reminiscent of our very own summer favourite ‘Kheere ka Raita’ this sauce comes together in a jiffy. Use it for sandwiches, wraps, rolls or dunk your chips in! All we need to watch out for is getting rid of all the excess water from the cucumber and we are good to go. 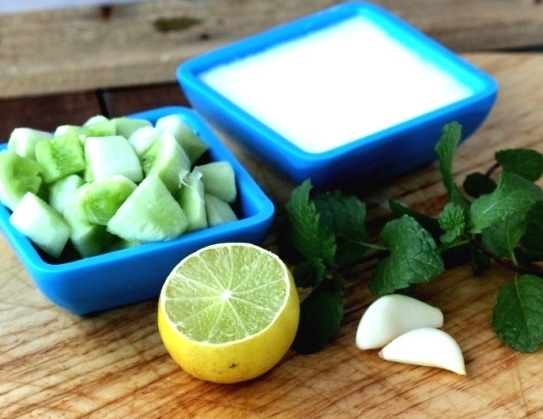 Sprinkle the cubed cucumber with salt and sit it in the colander covered with a plate with something heavy on the top so that the excess water drains. Alternatively, remove the seeds from the cucumbers and then dice them. 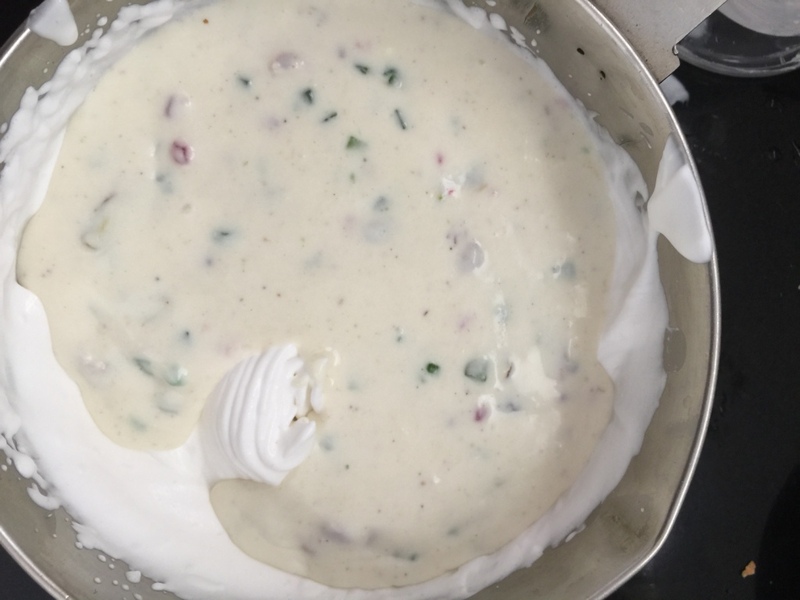 The seeds contain water and can make the sauce watery. 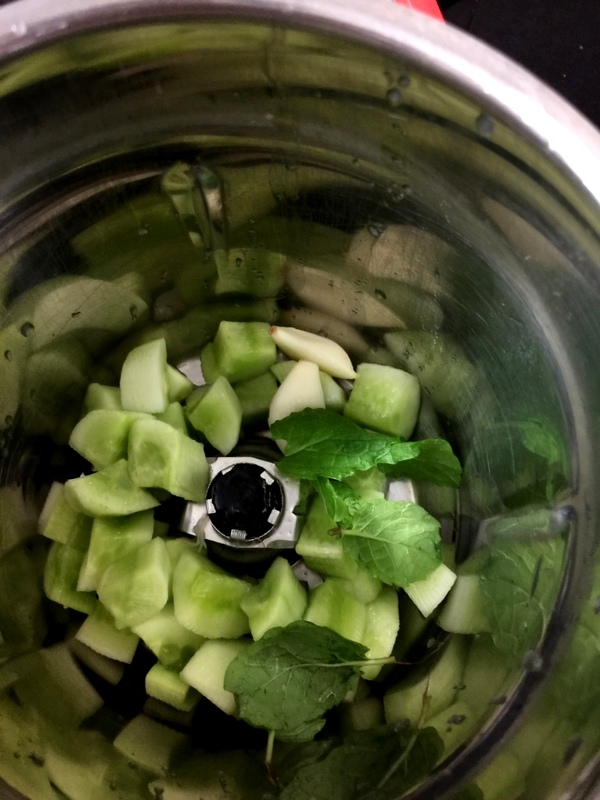 Pat dry the cucumber with a towel and throw it into the food processor with garlic, lemon juice and the mint leaves. Grind into a coarse paste. 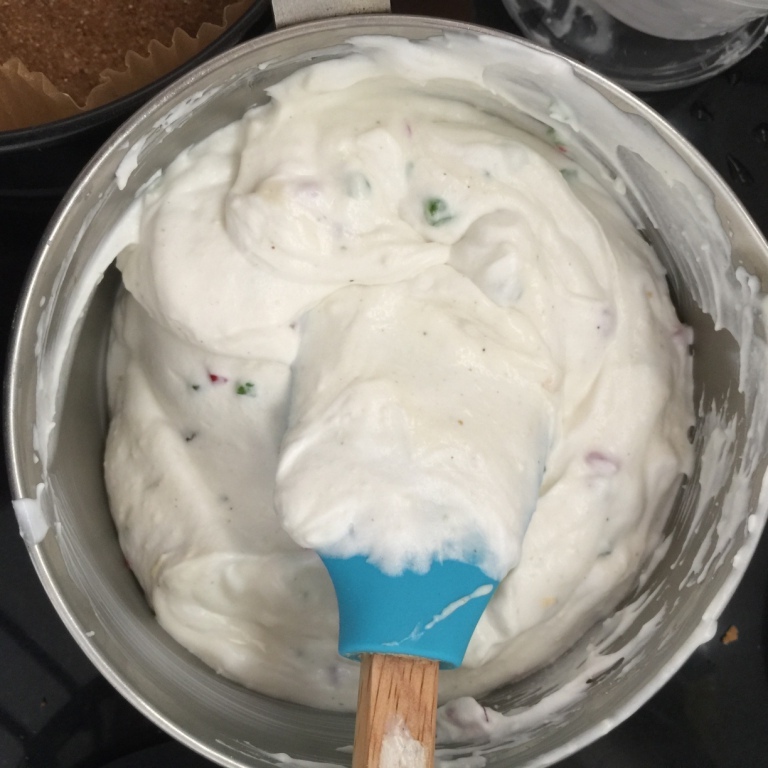 Stir into the yogurt and mix well. Check and add more salt or lemon juice if needed. It stays good in the refrigerator for 3-4 days. 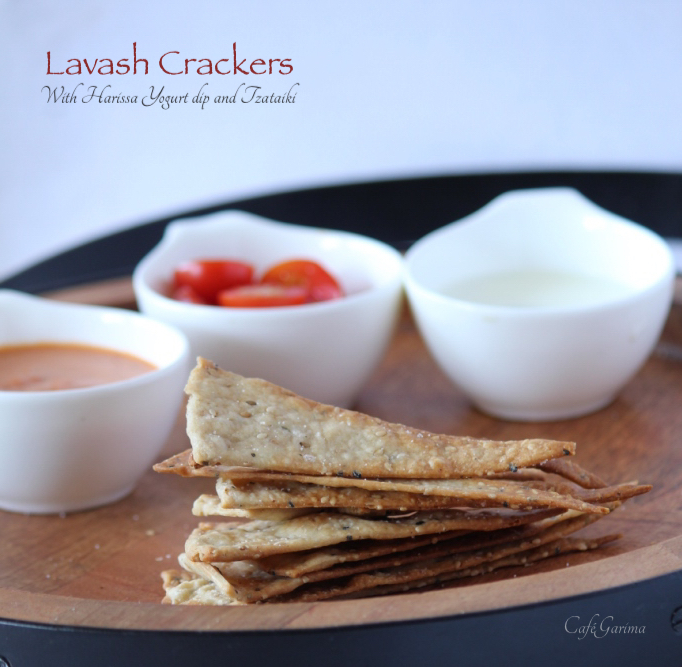 Lavash- Crisp Whole wheat Crackers! 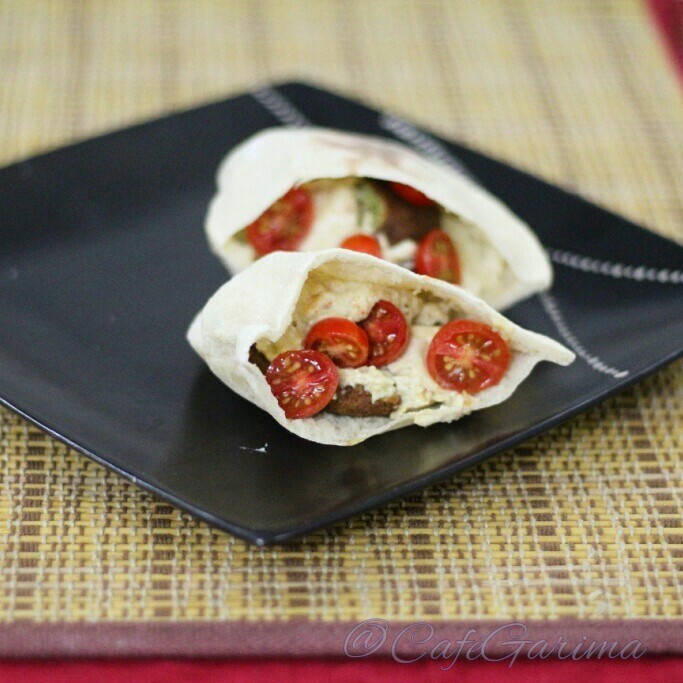 Lavash is a thin flatbread from the Middle East, specifically from Armenia. 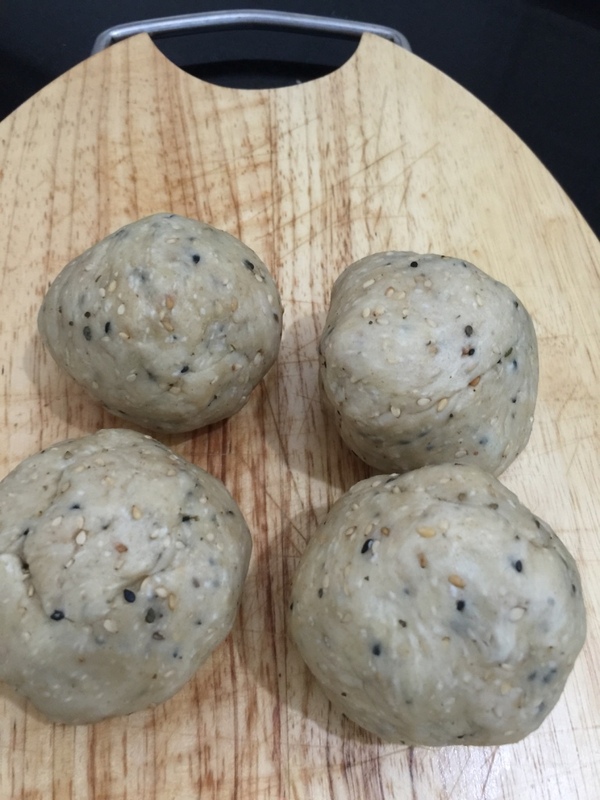 It can be made soft and used to make wraps and rolls. 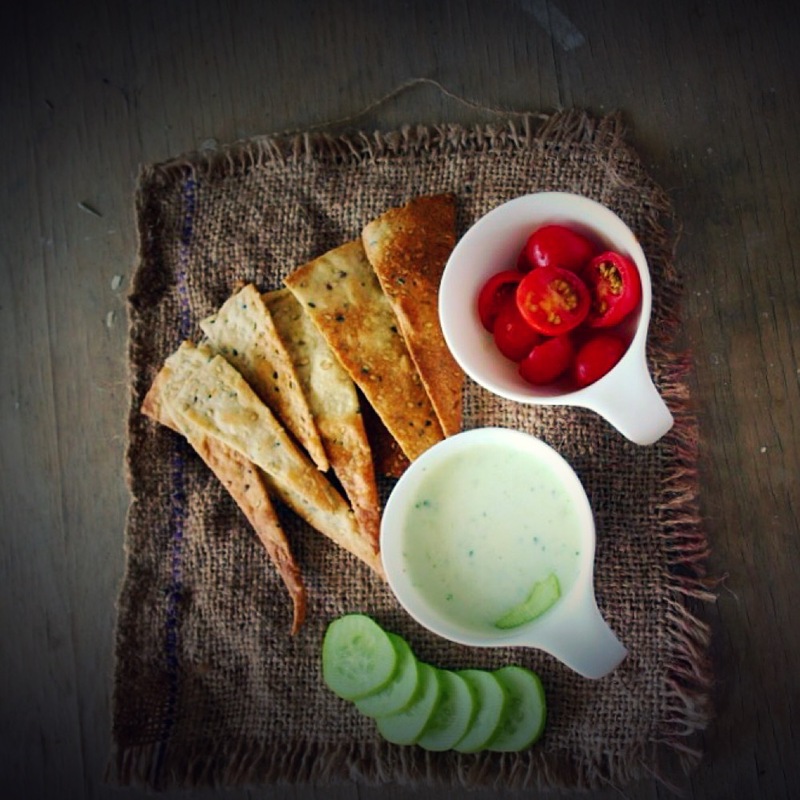 I made the crisp version, Lavash crackers and served them with Tzatziki and Harissa Yogurt sauce. 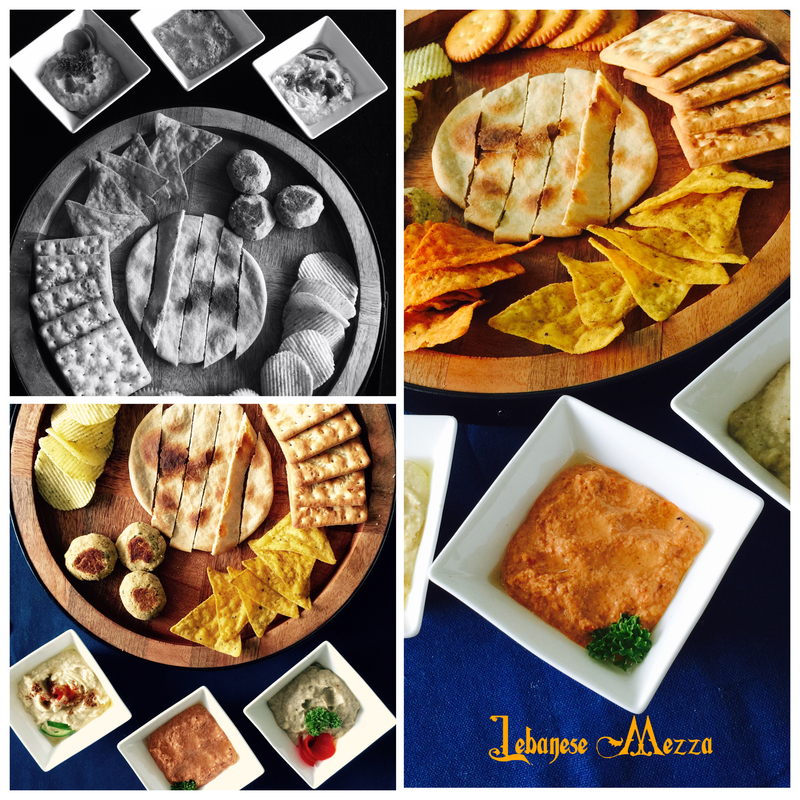 Lavash crackers are also served as a part of the Mediterranean Mezze Platter. 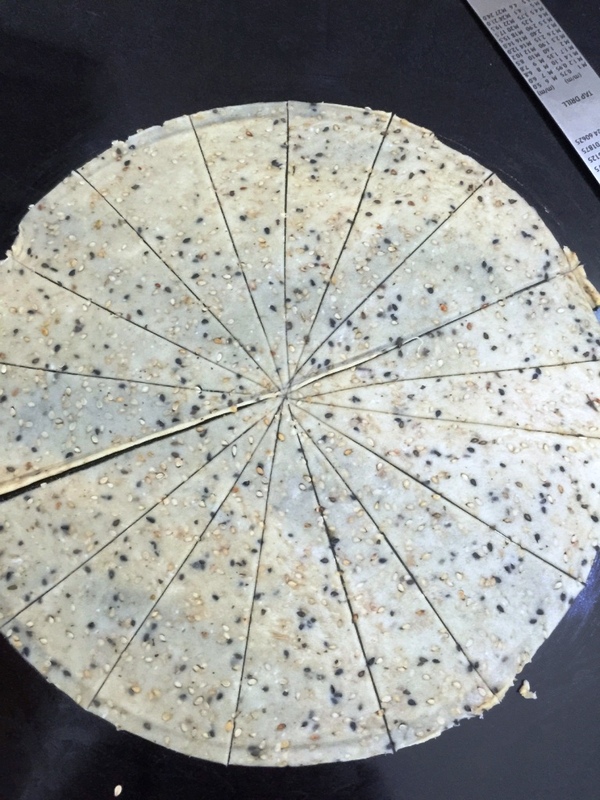 In Armenian villages, the dried Lavash is stacked high in layers to be used later, and when the time comes to rehydrate the bread, it is sprinkled with water to make it softer again. 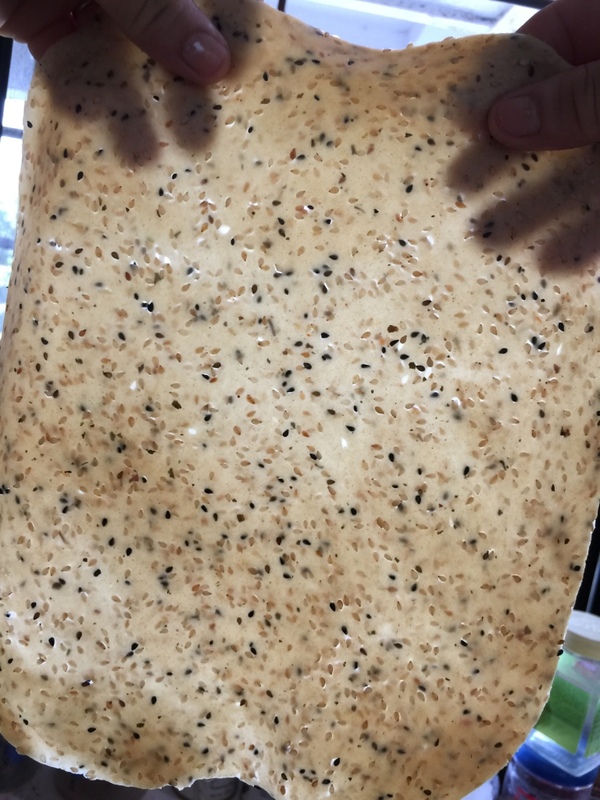 In its dry form, left-over Lavash is used in Iran to make quick meals after being rehydrated with water, butter and cheese. 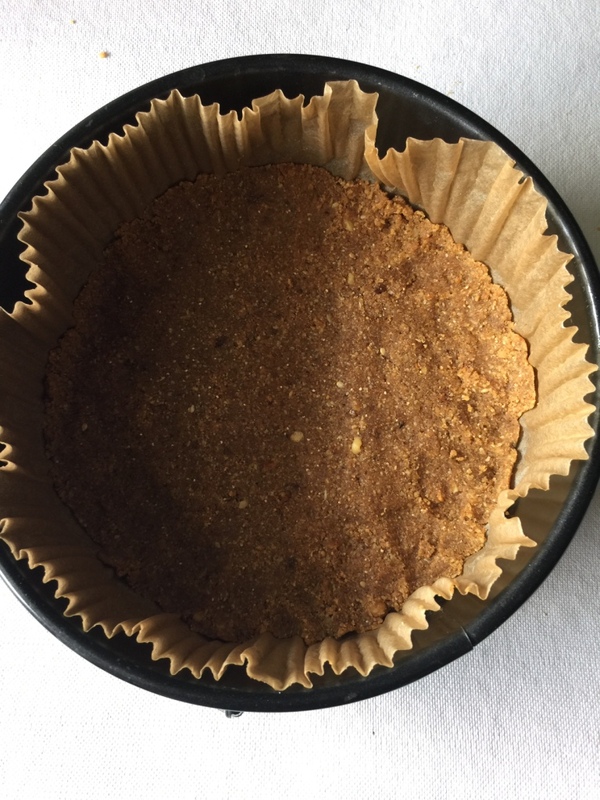 In Kashmir it is known as Lavasa or lavase and is a popular breakfast bread.Lavase pieces with green walnut kernels folded between them are considered a delicacy. 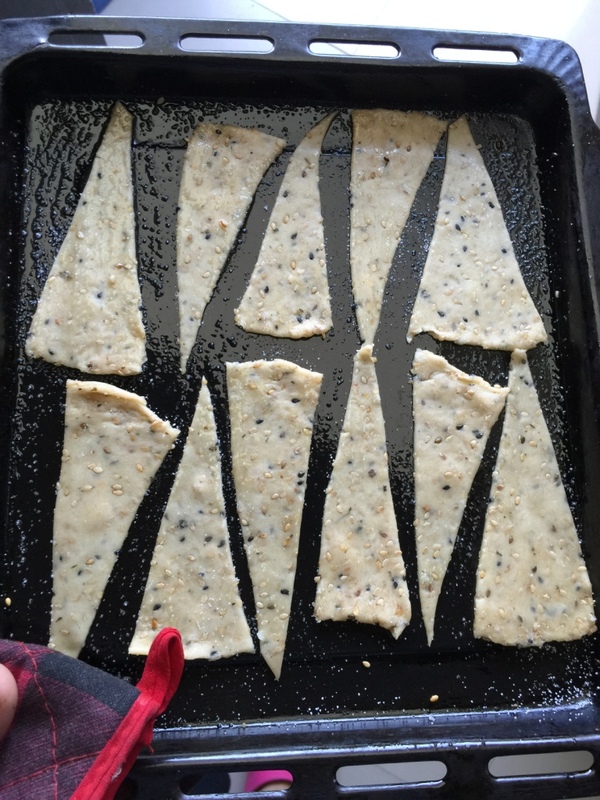 Lavash crackers are really simple to make and can be easily stored for days. 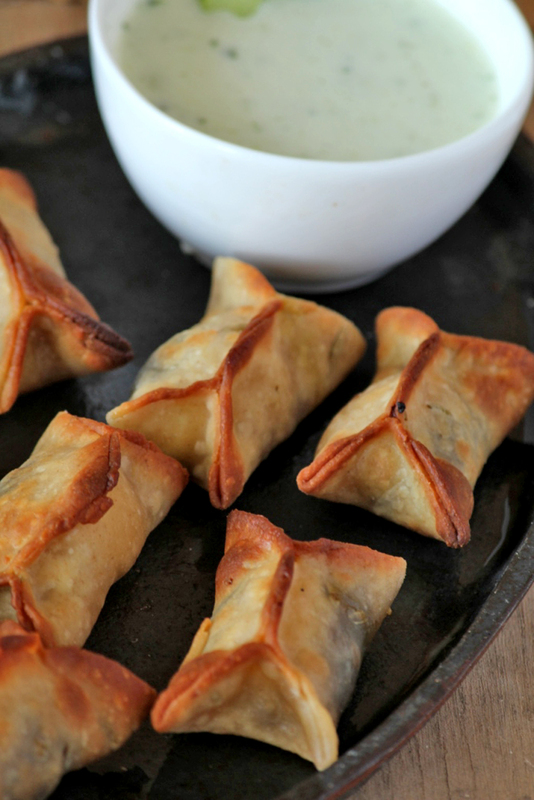 Enjoy them as an appetiser with a dipping sauce or just nibble on a couple with your cuppa. 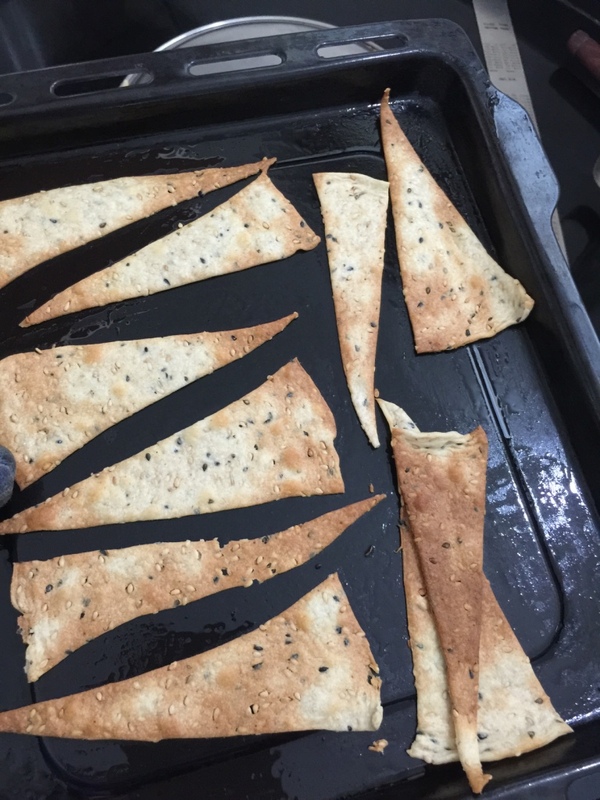 They reminded me of the Sesame Thins I had made; only these are the savoury version of those! 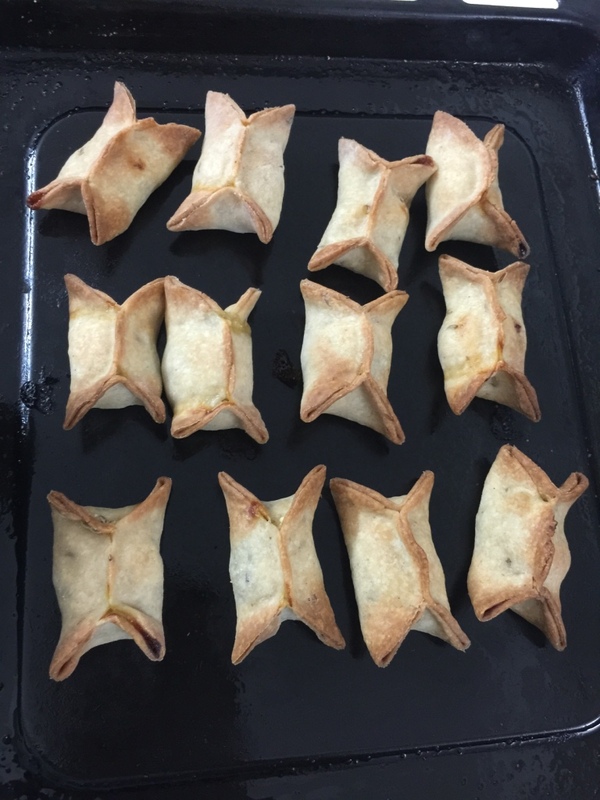 I made them with Aata (whole wheat flour). Pre-heat the oven for ten minutes and 180C and grease a baking tray. 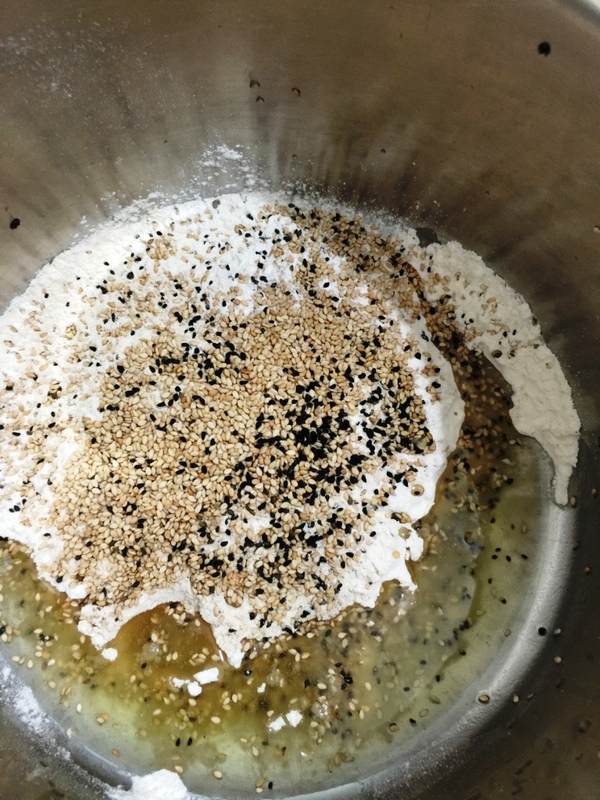 Toast the sesame seeds lightly. Add salt, olive oil and sesame seeds to the flour and rub with your fingers to mix well. 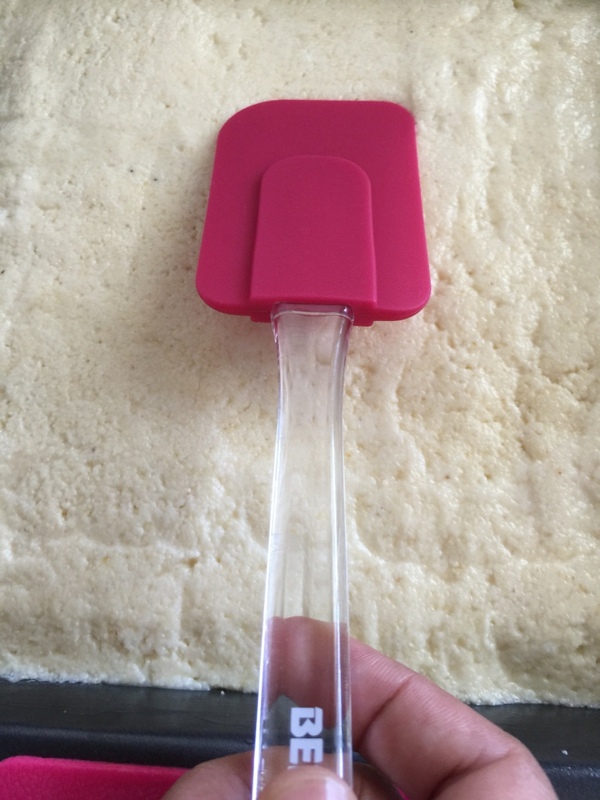 Add the water slowly and make a soft pliable dough. Roll out really thin, almost see through thin. Cut out a circle and slice into triangles. 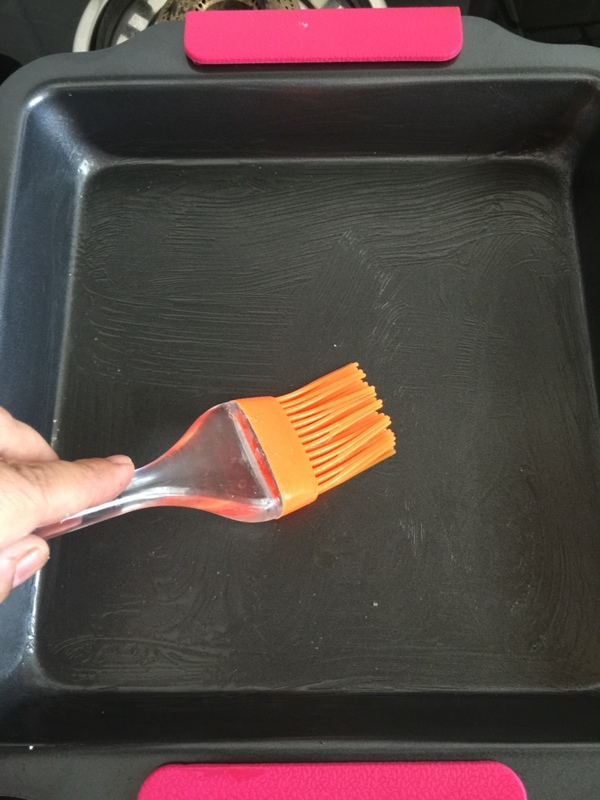 Transfer to the greased tray and brush the top with oil. Bake till golden and crisp. Recipe sourced and adapted from here. 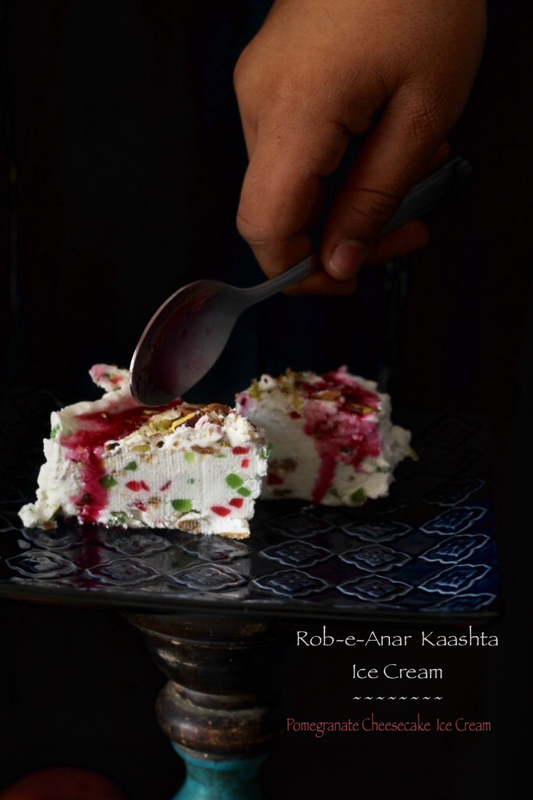 I present Rob-e-Anar Kaashta Ice cream ,served over a bed of Cocktail Shikaf. 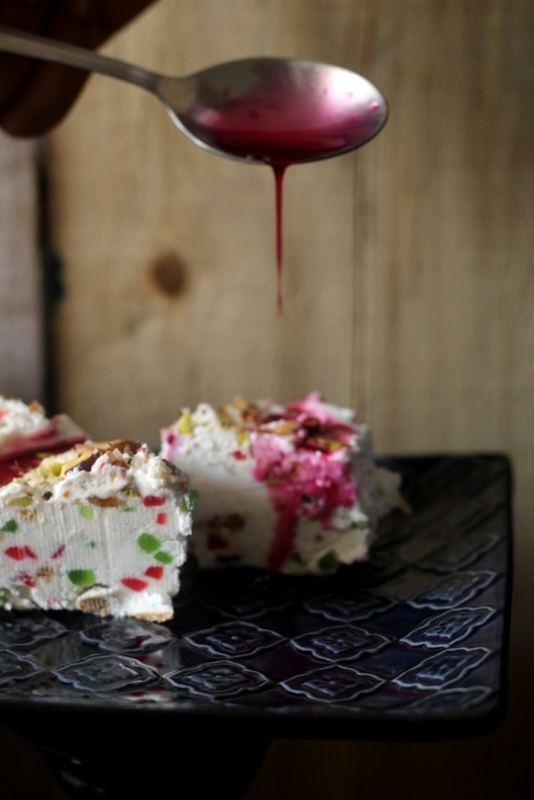 A Pomegranate Cheesecake Ice cream served with Fruit Cocktail, Lebanese style! 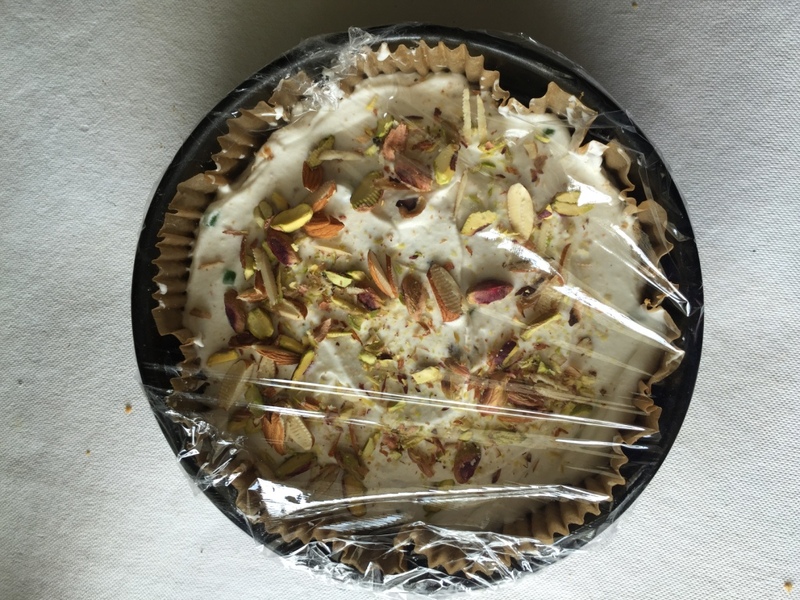 This Frozen Treat is my tribute to all the lovely Lebanese desserts I saw on this wonderful blog- Mama’s Lebanese Kitchen , which I have been closely following for the past month in the course of my Lebanese quest. This month onward, I have joined the ‘Kitchen Divas’ and will be doing a theme based post every month. The theme for April is Frozen Treats. 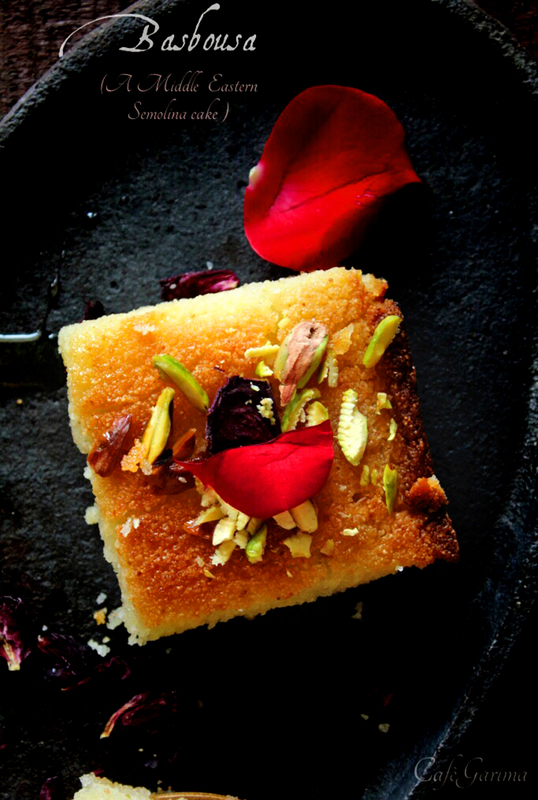 I have incorporated Kaashta/Clotted milk with rose water, Rob-e-Anar/Pomegranate molasses and Cocktail Shikaf to get this gorgeous dessert. 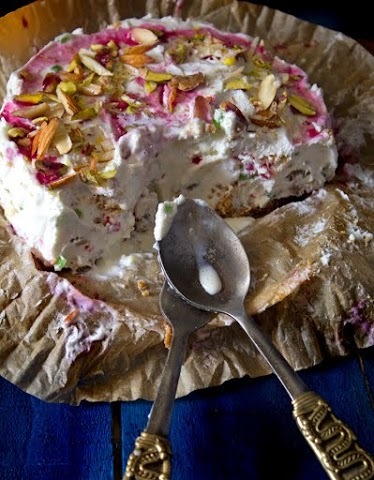 Kaashta/Astha is clotted cream prepared with rose water and orange blossom water. To prepare it add a tsp of sugar to 3 cups of whole milk. 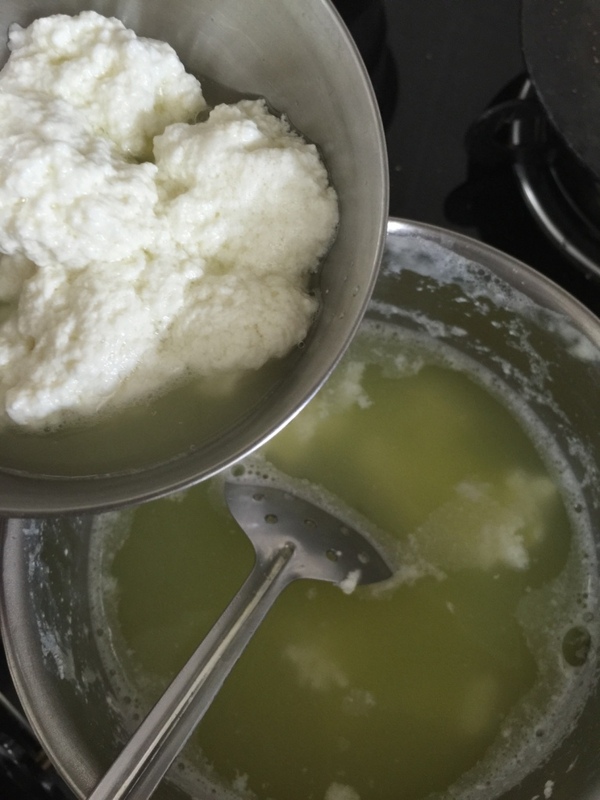 Bring this mixture to boil and add a few drops of lemon juice. The milk starts to clot immediately. Add rose water and orange blossom water and mix well. With a strainer, collect the clotted cream (or chhena as we call it!) and transfer it to another vessel. Keep collecting till the liquid gets clear. Add a few drops more of lemon juice if required. 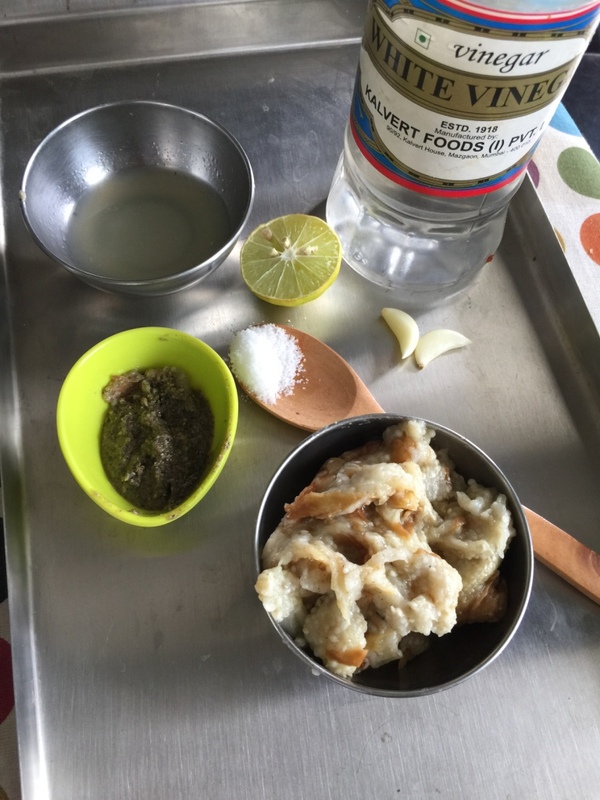 To incorporate into the ice cream, I drained the Kaashta a little to get rid of the excess liquid. Make sure the cream is chilled before you start making the ice cream. I like to set the ice cream in a butter paper lined tin. It is easy to get it out neatly. Any metal or plastic container may be used. 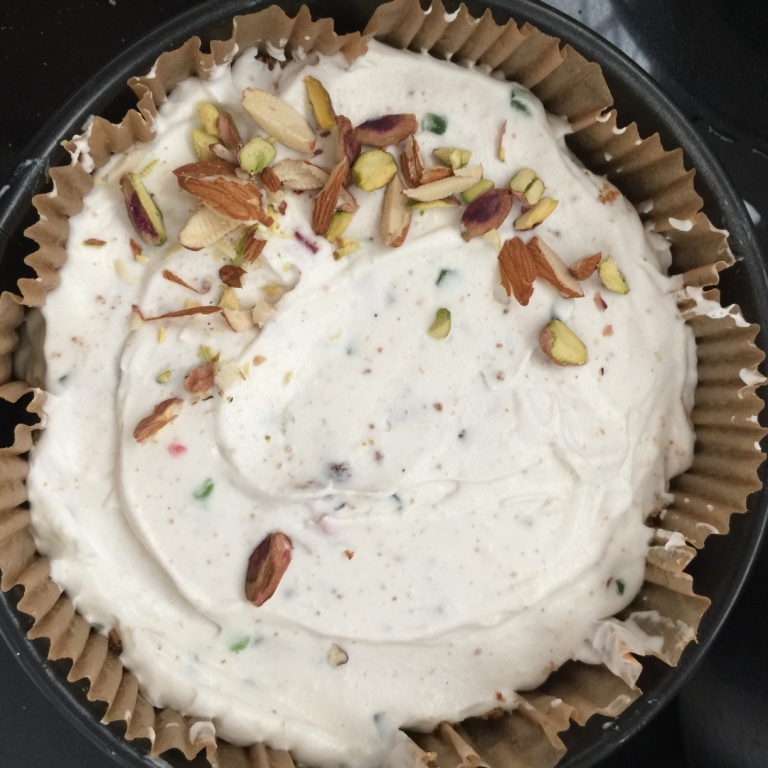 Because I wanted to make a cheesecake style ice cream, I used a spring form tin. In fact, any tin can be lined with butter paper and used. 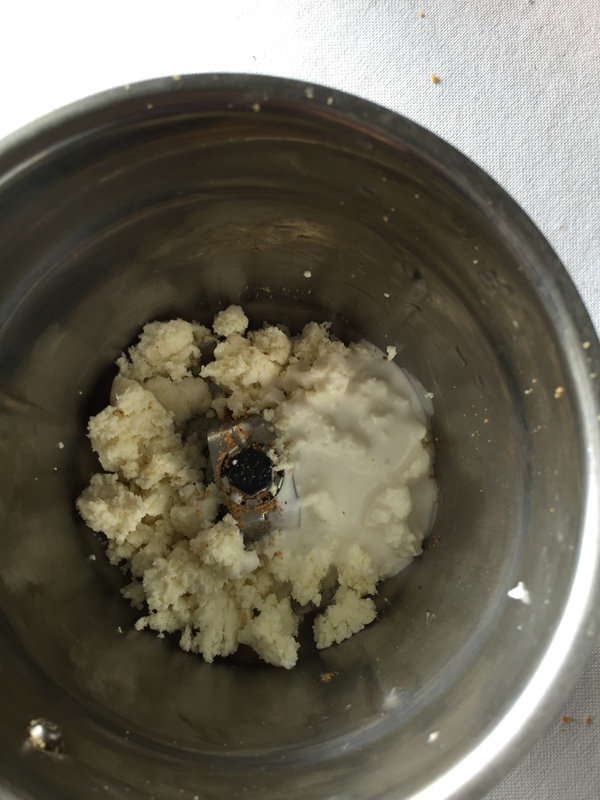 Crush the biscuits and mix with the butter to form a bread crumb like mixture. Spread HALF of the of the biscuit crumb mixture at the bottom of the tin and press it in nicely. Save the other half for layering the ice cream. Leave the tin in the freezer for about fifteen minutes. 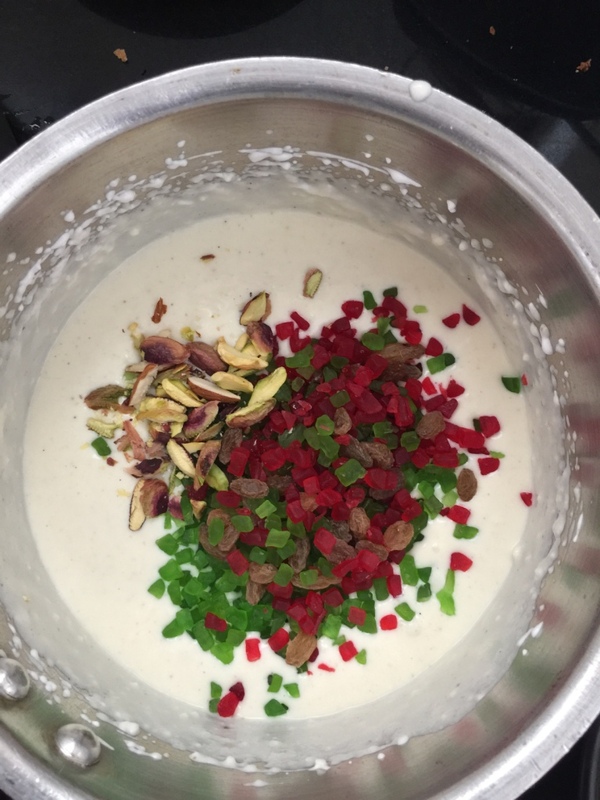 Crumble the kaashta into the mixer and add about 7-8 tbsp cream. 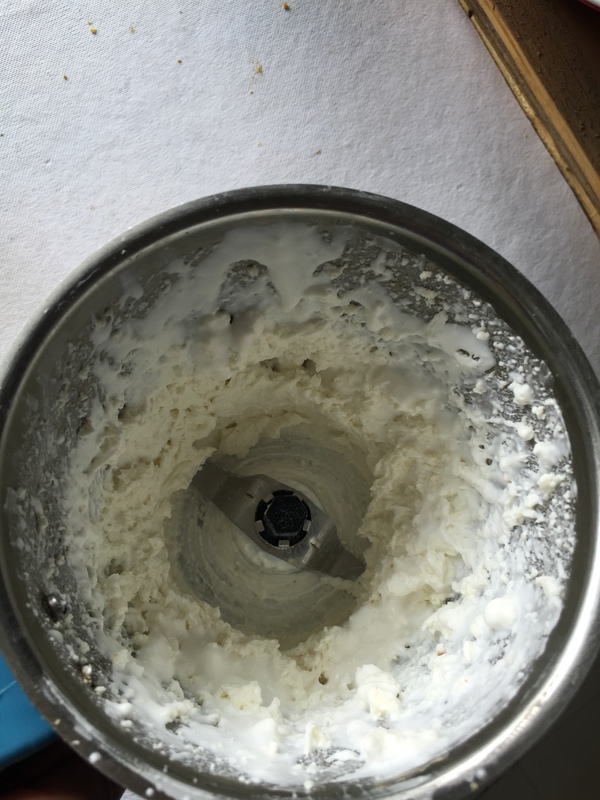 With an electric hand mixer, mix the kaashta and condensed milk. Beat well for half a minute on low. 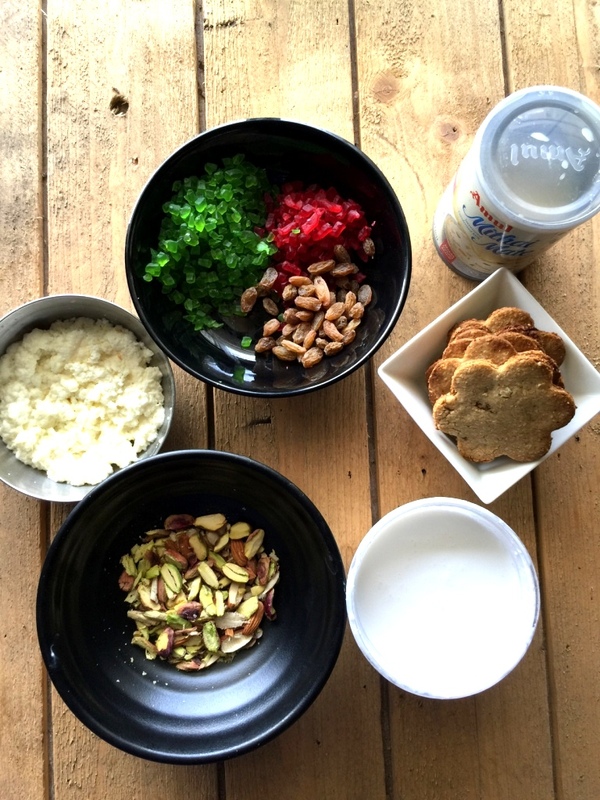 Fold in the mixed nuts, raisins and tutti frutii. 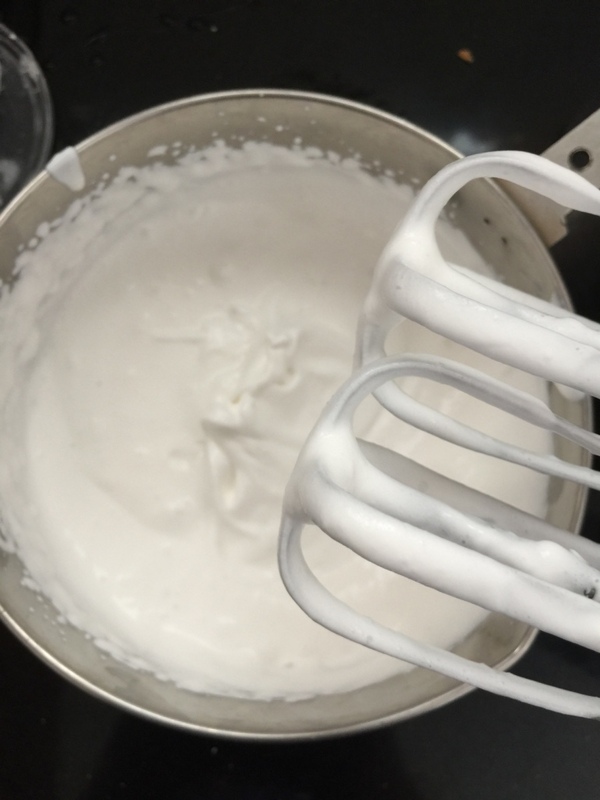 In a separate bowl beat the cream till peaks form. 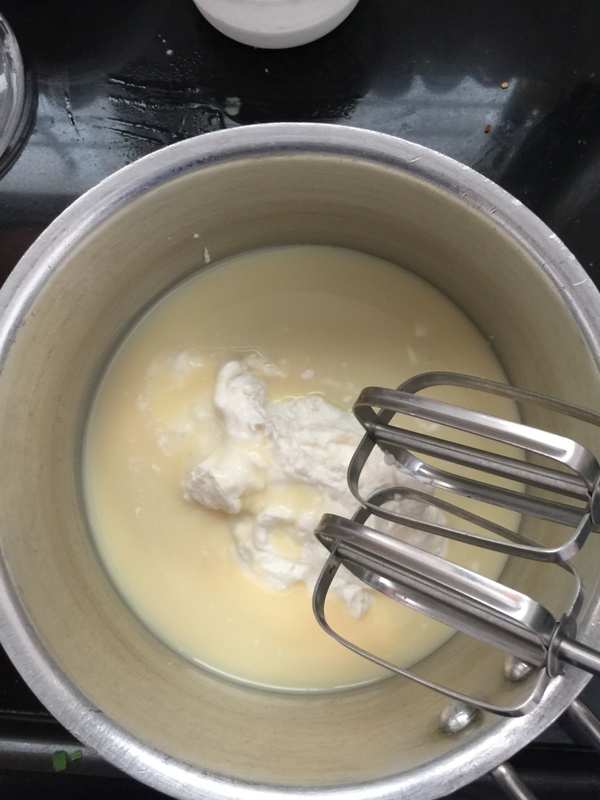 Gently fold in the condensed milk mixture into the cream. 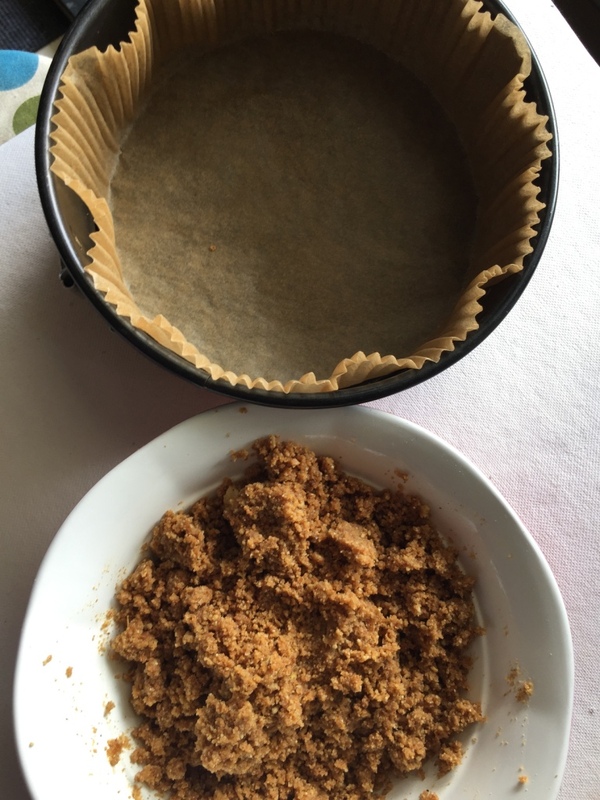 Take the tin out of the freezer and gently transfer a layer of ice cream mixture over the biscuit layer, sprinkle with some crumb and repeat till the mixture is used up. 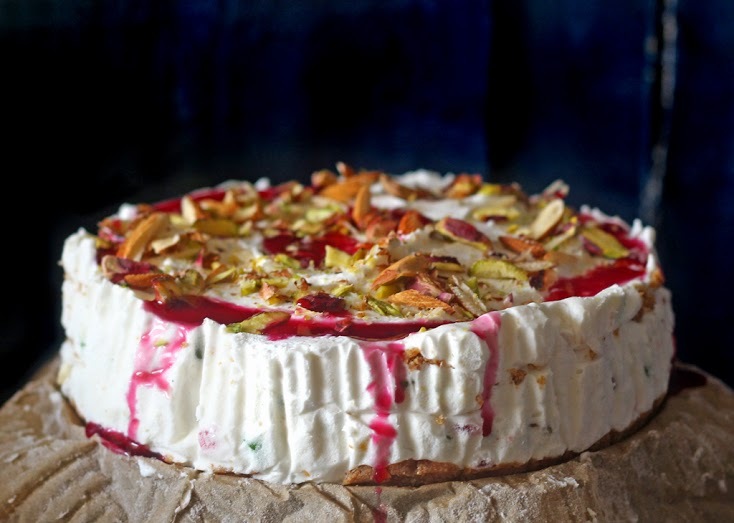 Generously sprinkle the top of the ice cream cake with slivered pistachios, cashews and almonds. Seal it nicely with cling film and a layer of aluminium foil. Let it set for 5-6 hours. Remove from the freezer fifteen minutes before serving. 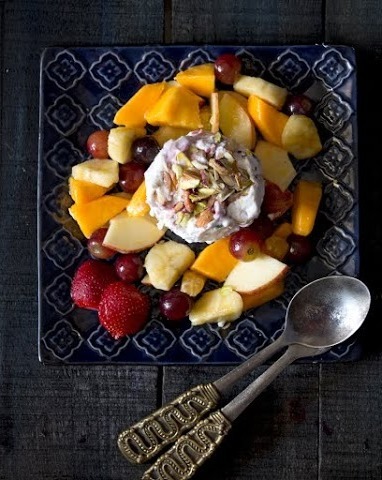 Prepare fruit cocktail or Cocktail Shikaf by chopping a cup of mixed fruits per serving. 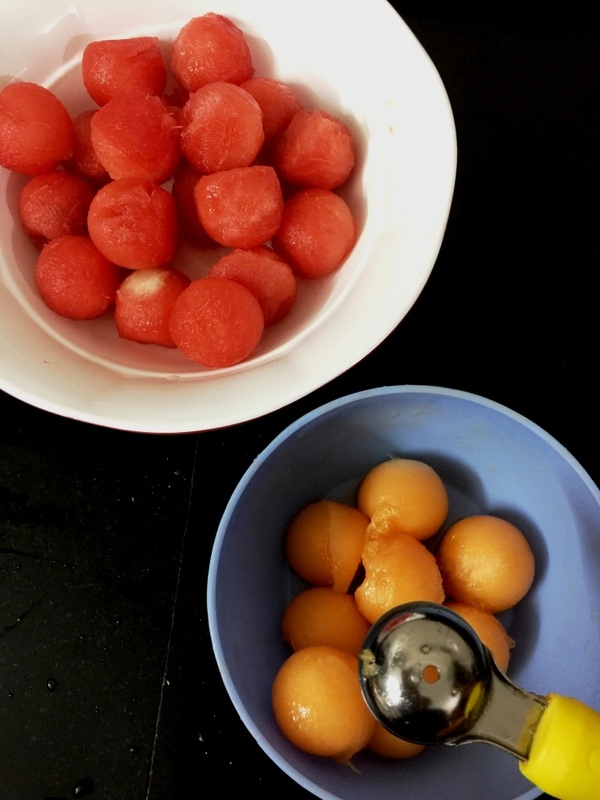 I used mangoes, banans, apples, grapes,oranges and strawberries.Any seasonal or tinned fruits may be used. Puree a few strawberries or kiwi fruits and mix well with the fruits. Drizzle some honey and throw in some chopped walnuts. 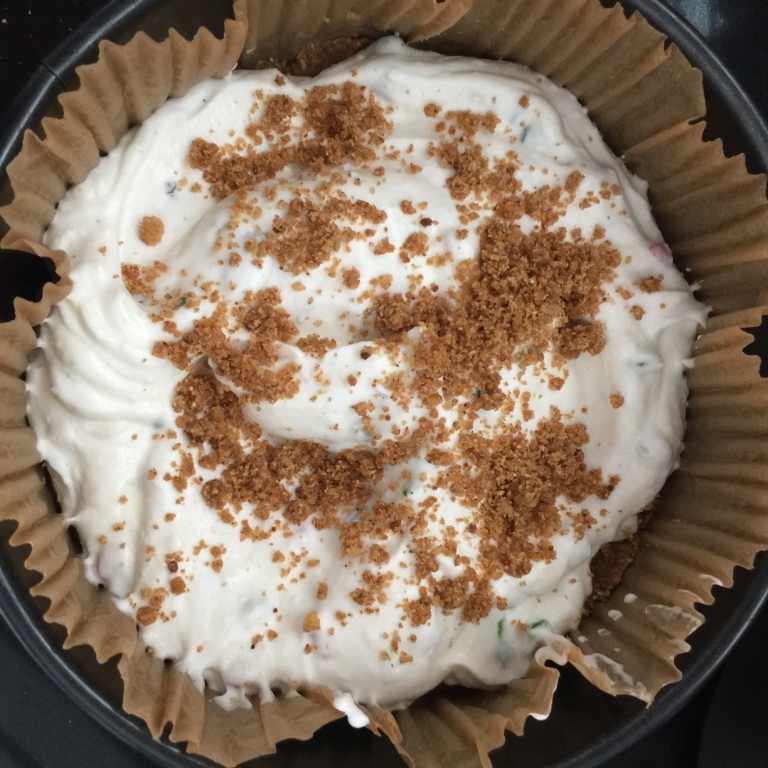 Check out the other #FrozenTreats my blogger friends have dished out this month! 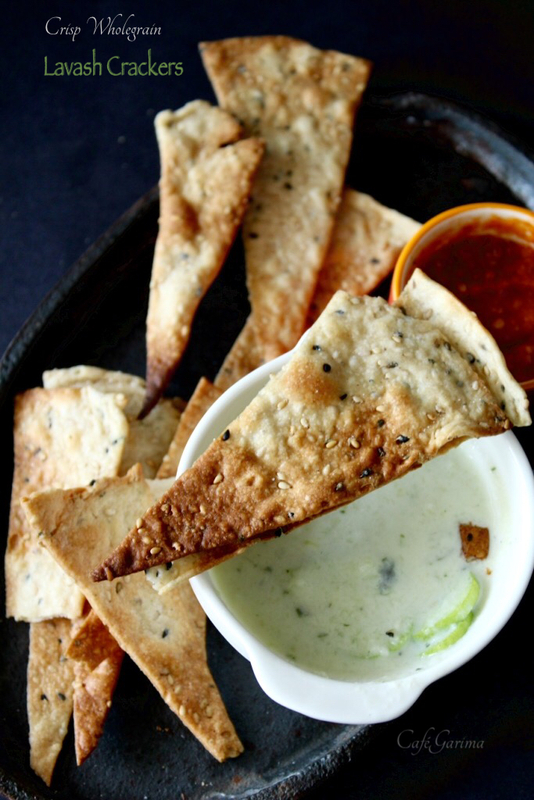 It’s a very chip and dip kinda weather. 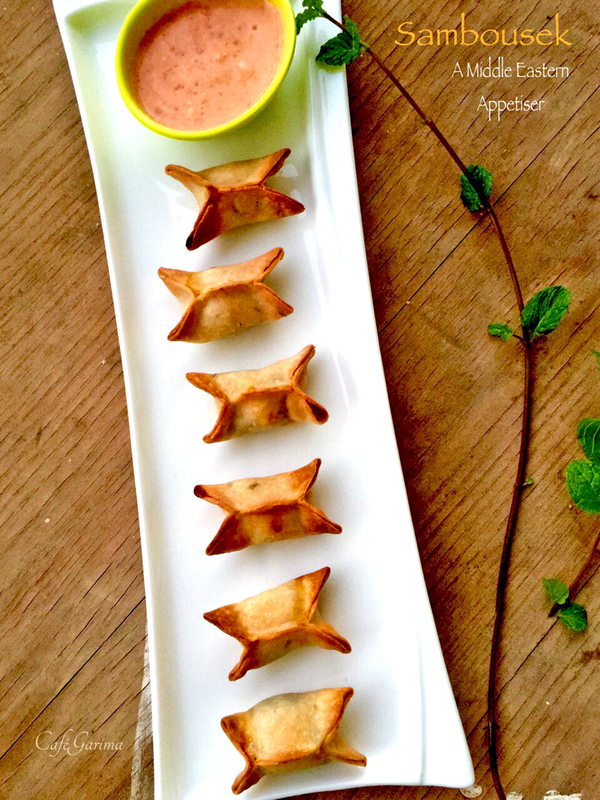 A regular meal doesn’t seem to appeal but a snacky affair makes the palate sing! 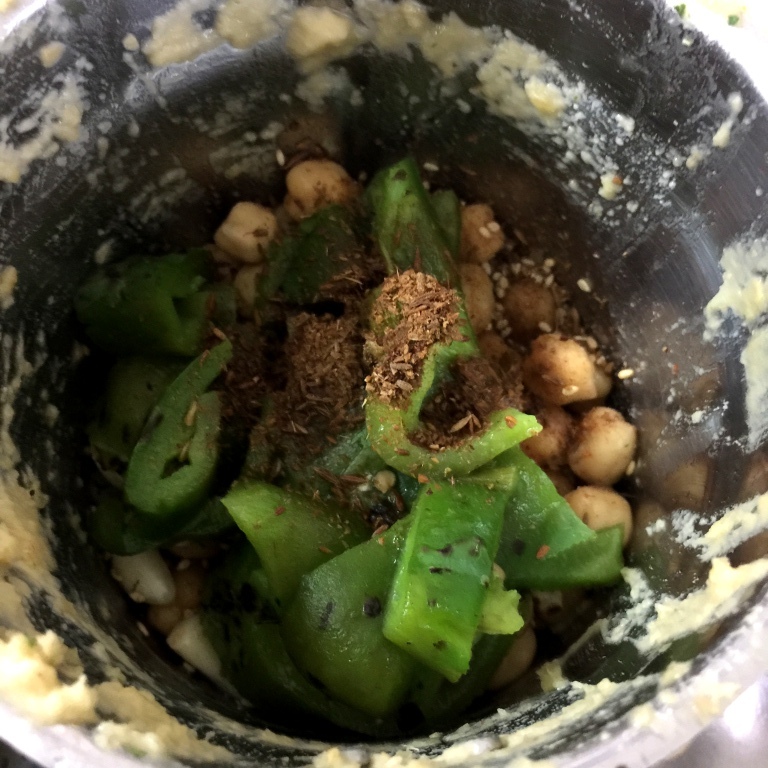 So here is a lighter and fresher version of hummus, loaded with peppers (red or green whichever you want to make it with! ) 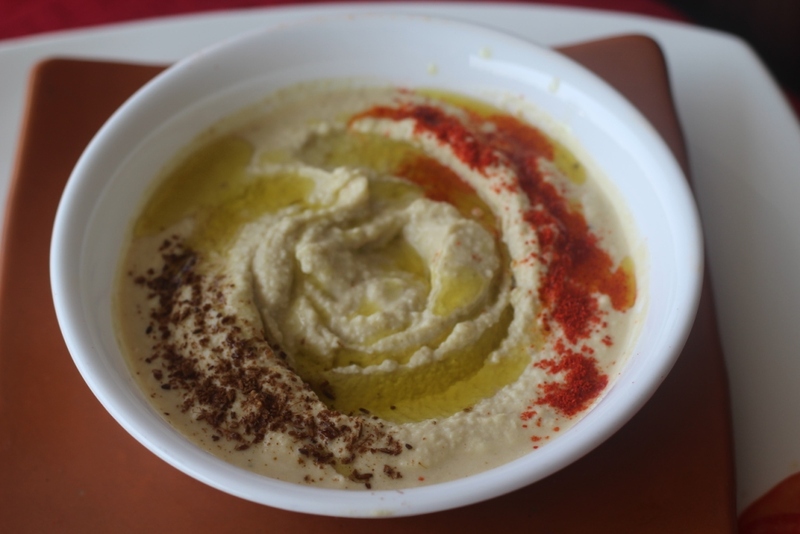 Fill it into Pita sandwiches, or simply use a sandwich spread or use it to dunk your nachos in, hummus is a healthy treat for the taste buds. 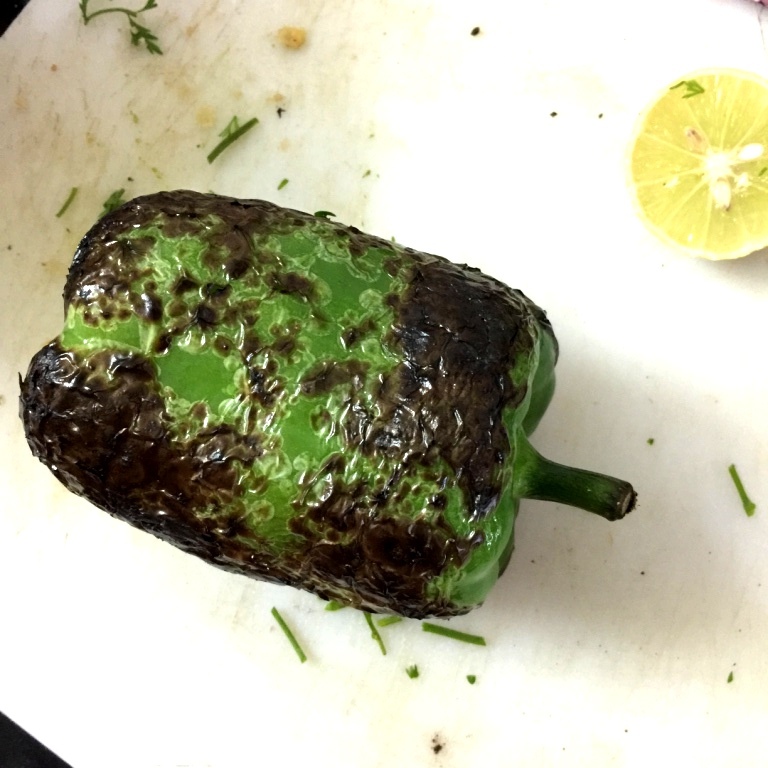 Roast the pepper and chilli over an open flame till it is charred all over. Alternatively, char them under a hot grill. Peel and cube the pepper and chop the chilli. Heat the olive oil in a small pan and fry the onions till tender. Add the cumin and coriander powders and take off the heat. Let cool. Add the chilli and pepper along with the chilli and pepper and all the other ingredients listed above. 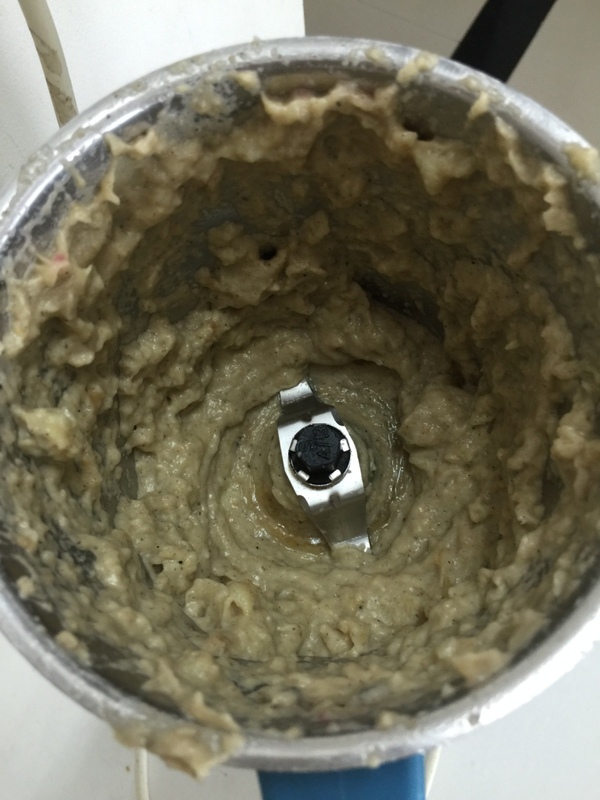 Blend till you get coarse, grainy paste adding water (saved from boiling the chick peas) slowly as required. Do not add all the water at once! Garnish with paprika or some cumin powder. My Gran makes her special special ‘bina chaaunk ka baingan bharta’ where she roasts the aubergines, peels and mashes them but does not further cook or temper them as is usually done in case of ‘Baingan ka Bharta’. She simply adds fine chopped tomatoes, onions, green chillies and fresh coriander along with some spices and serves it with a generous squeeze of lime. 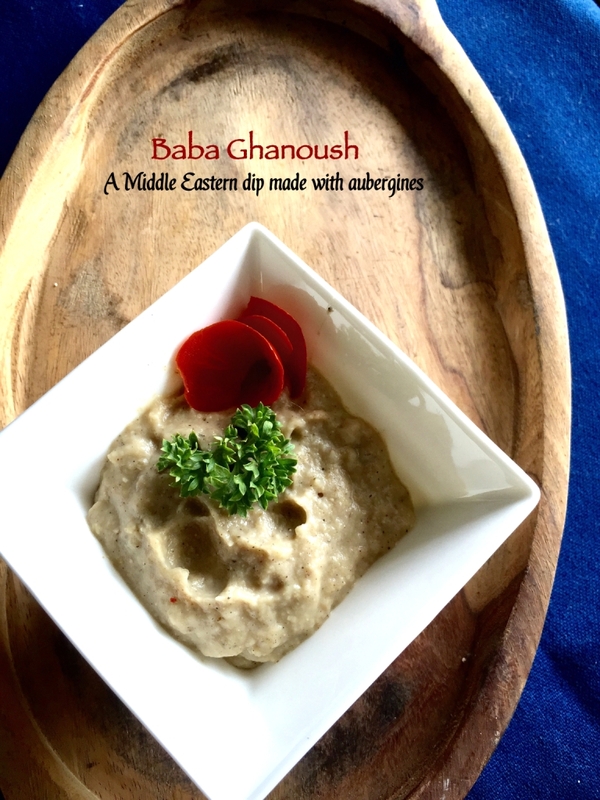 When I read up the recipes for Baba Ghanoush/Ghanouj, it reminded me of Naani style baingan bharta. And I got to say they are close,almost identical in fact! I am amazed at the way food finds echoes across boundaries. 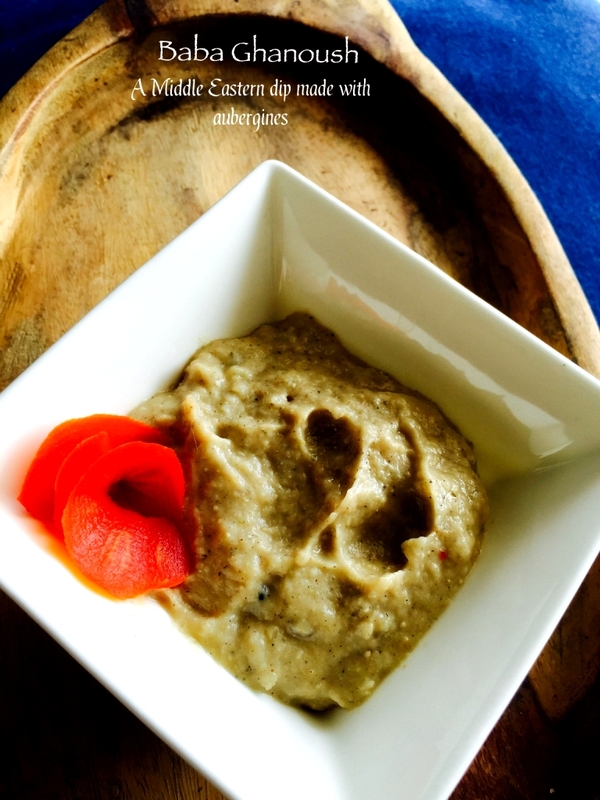 I made Baba Ghanoush with the green aubergines rather than the dark ones as they are slightly sweeter and milder than the other ones. Roast the aubergine over the stove till the skin is completely charred. Alternatively slice into two and char it under a hot grill. Peel, remove the seeds and mash it once it cools down a little. Leave it in a colander for about 15 minutes so that the excess liquid drains off. 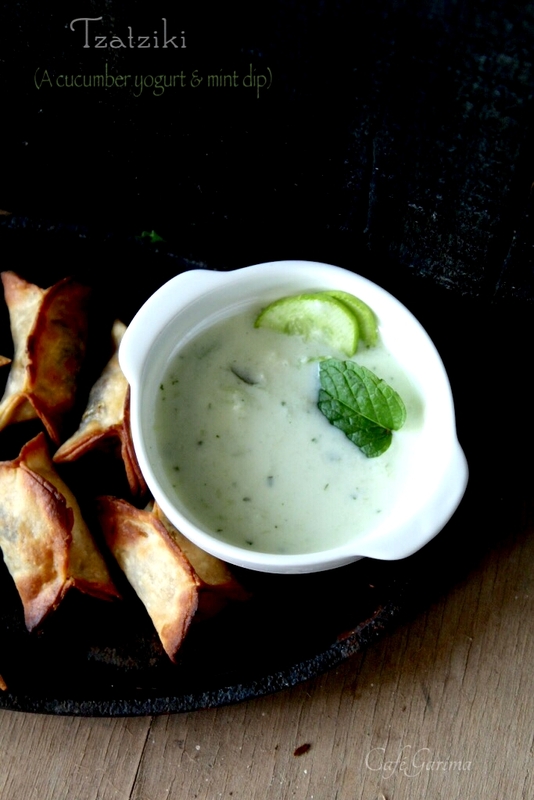 This will ensure a thick and creamy dip rather than a watery one. 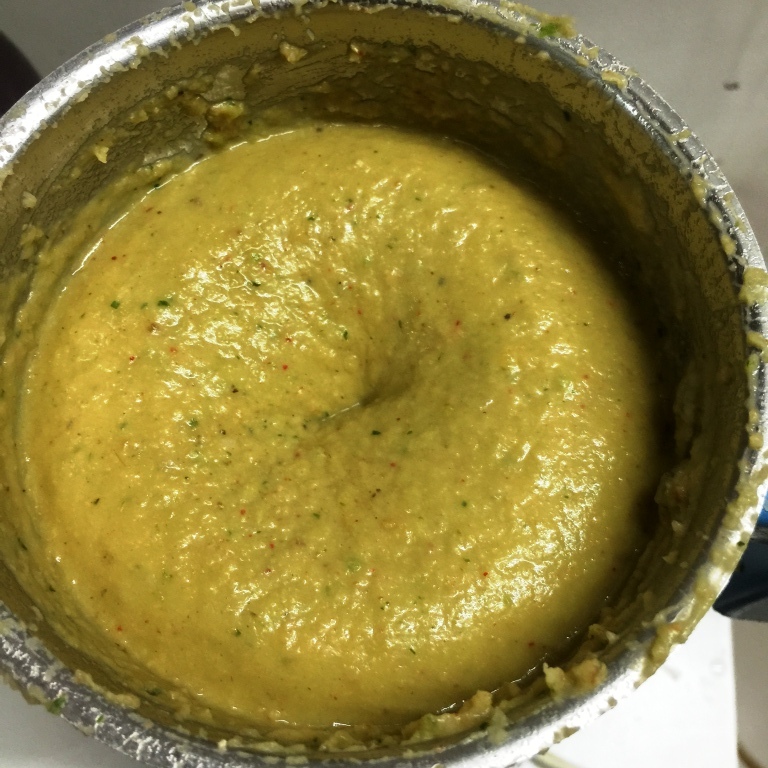 Blend the aubergine mash and all the other ingredients in the food processor till you get a coarse paste. Drizzle with some olive oil. Garnish with some parsley, olives and a tomato rose. 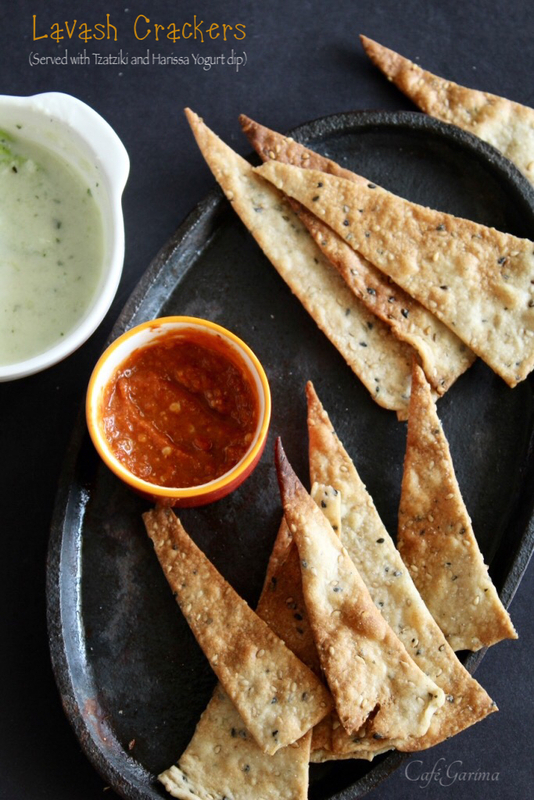 Serve cold with warm pita bread wedges, nachos and crackers. 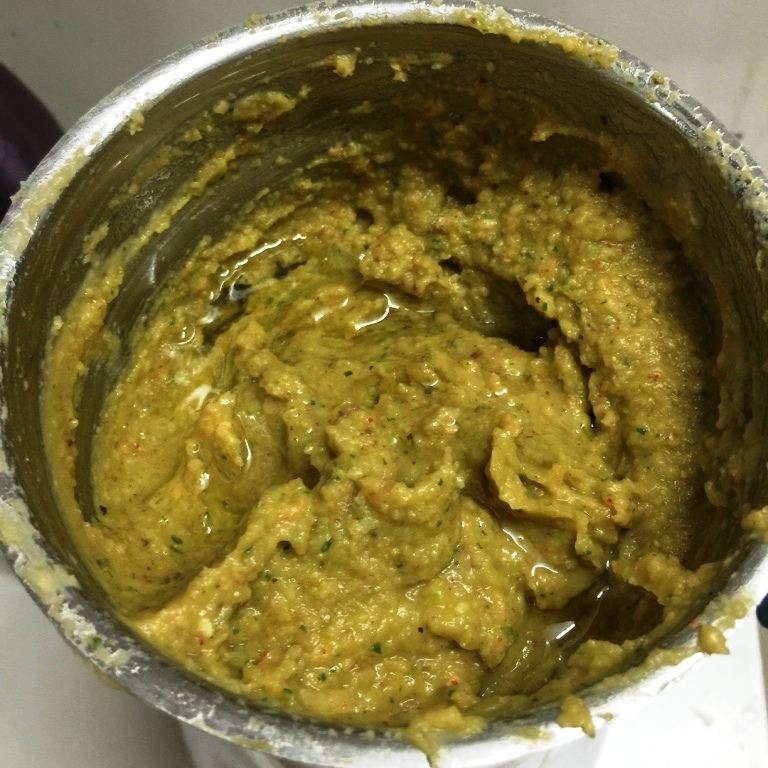 Blend the aubergine mash and all the other ingredients, apart from olive oil, in the food processor till you get a coarse paste. 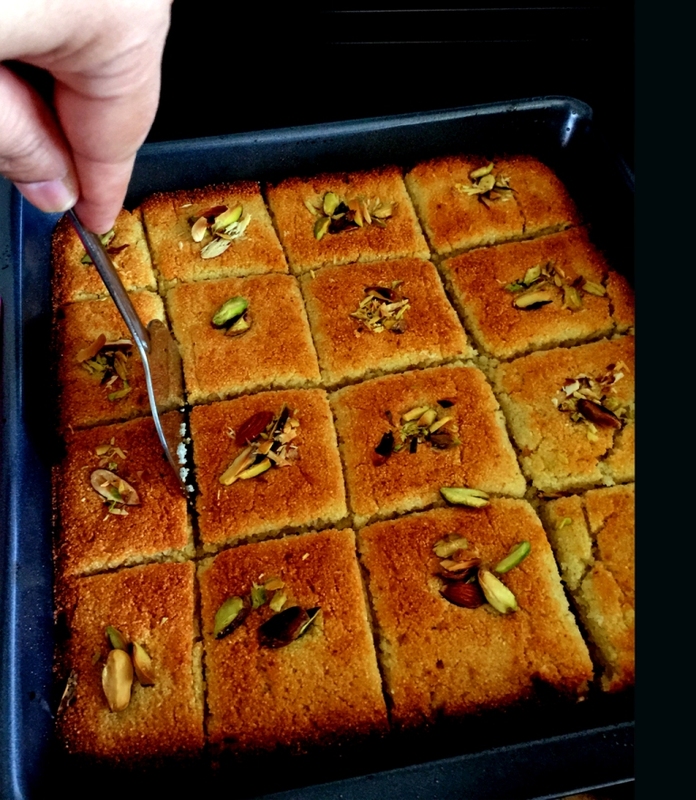 Recipe sources- Mama’s Lebanese Kitchen and Syrian Foodie in London.